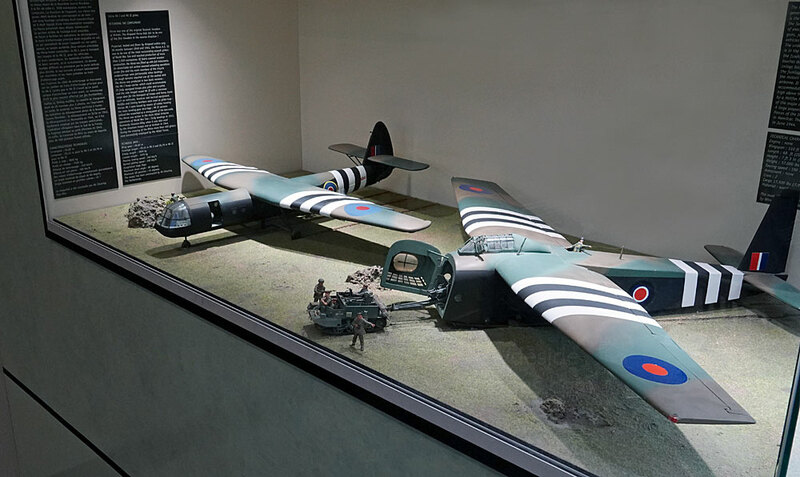 Late on Monday 5th June 1944, having left even ahead of the pathfinders, converted Halifax bombers towing six Horsa gliders containing D Company of the 2nd Battalion, Oxford & Buckinghamshire Light Infantry under the command of Major John Howard, headed across the English Channel. 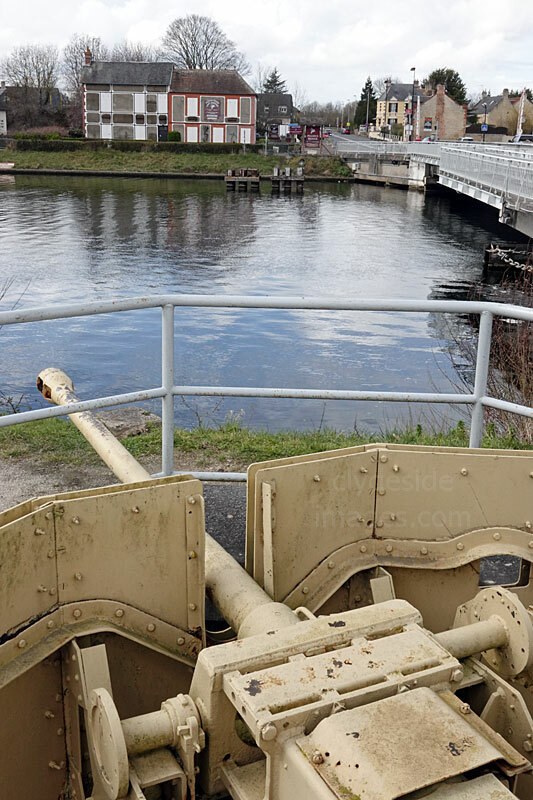 Howard`s mission was to land on top of the German fortifications guarding two strategically important crossings, namely the bridges over the River Orne and Caen Canal, and neutralise the defenders before they had a chance to blow the bridges. This aerial assault would herald the start of the D-Day invasion. 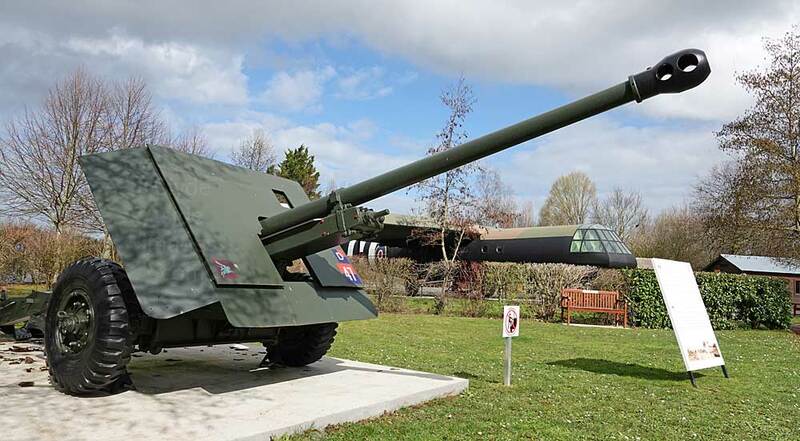 The Merville Battery, to the east of the mouth of the River Orne was another British Airborne objective, which would later fall to Otway`s paratroopers. There was a gap in the flak defences at Cabourg and the order for silence was given as Howard`s Horsas were released from their tug aircraft to begin their sedate descent through the stormy sky with only the sound of the wind for company. 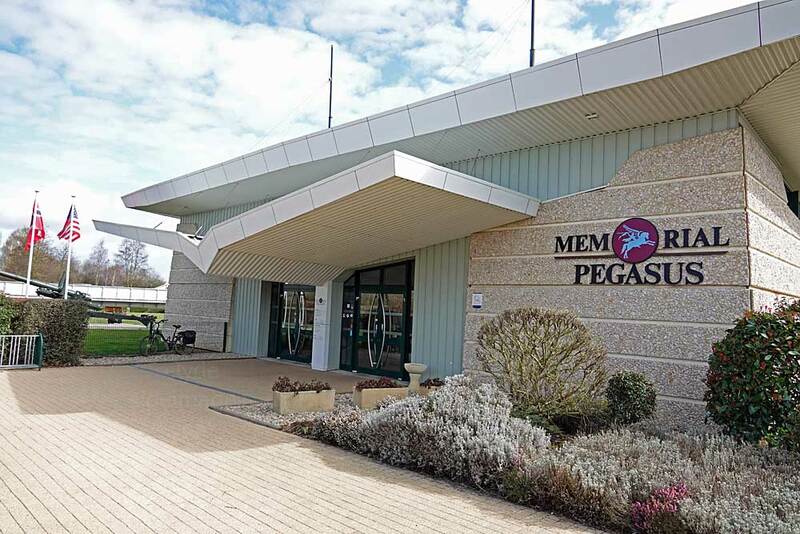 ​Navigating at night with a stop watch and a compass, the glider pilots landed their aircraft within metres of Benouville bridge, now immortalised as Pegasus. The Allied air commander, Air Chief Marshall Leigh-Mallory, commented that the operation was one of the most outstanding feats of precision flying of the war. This aerial shot taken during daylight hours on 6 June emphasises just how close the three nearest gliders got to their target. Within 15 minutes, Howard`s men had stormed and neutralised the enemy defences and moved out to establish a defensive perimeter, bracing themselves for the inevitable counter-attack. More information on the battle for the bridges can be found on the British Airborne Operations main page. 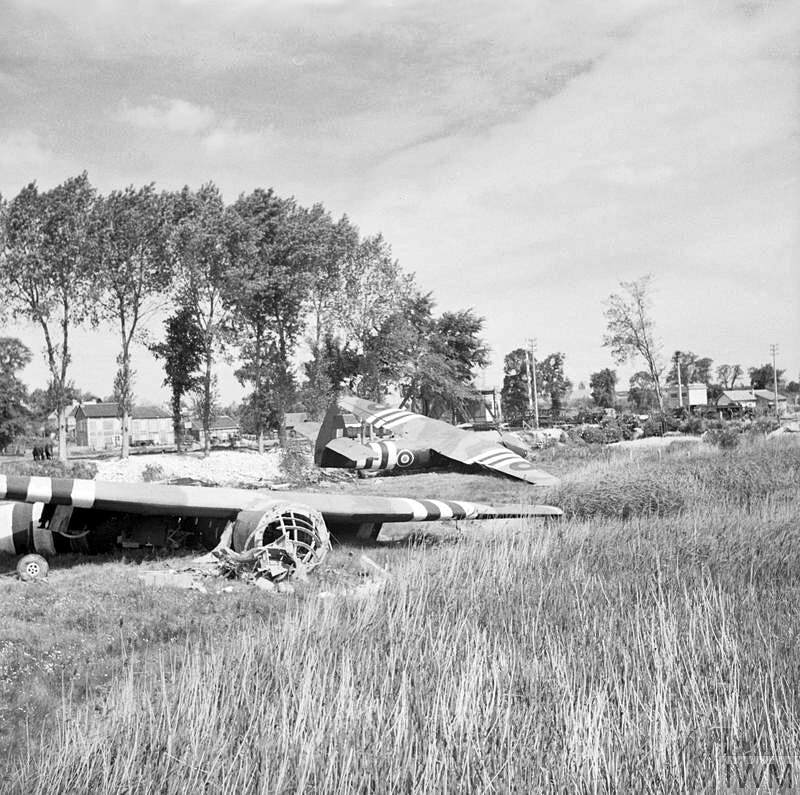 Left: This ground-level view of the Horsas near the Caen Canal bridge at Benouville was taken on 8 June 1944. 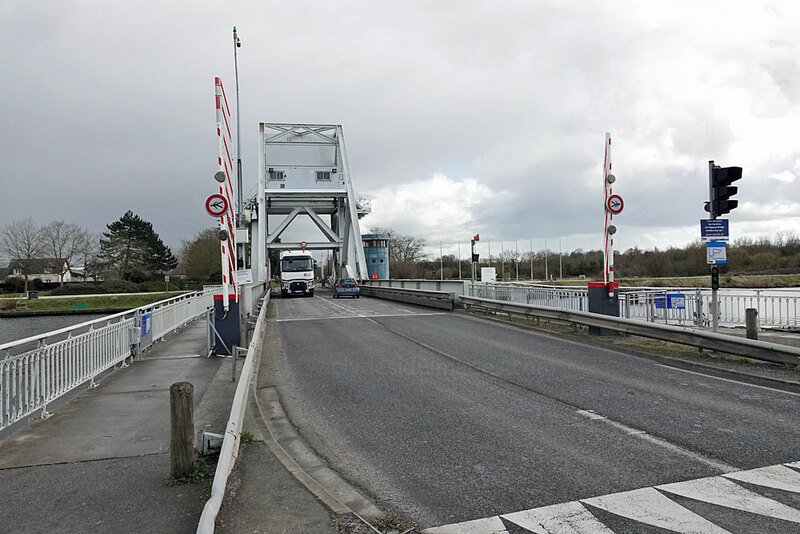 Part of 6th Airborne Division's 'coup de main' force, they had carried men of 'D' and 'B' Company, 2nd Battalion of the Ox` and Bucks Light Infantry, which captured this bridge and, just 400 metres away, the Ranville Bridge over the Orne River, in the early hours of June 6th. In the foreground is glider No. 93, which carried Lieutenant David Wood's platoon, with behind, No. 91, which carried the force commander, Major John Howard, and Lieutenant Den Brotheridge's platoon. Pictured below is Glider No.3 which broke its back on landing. 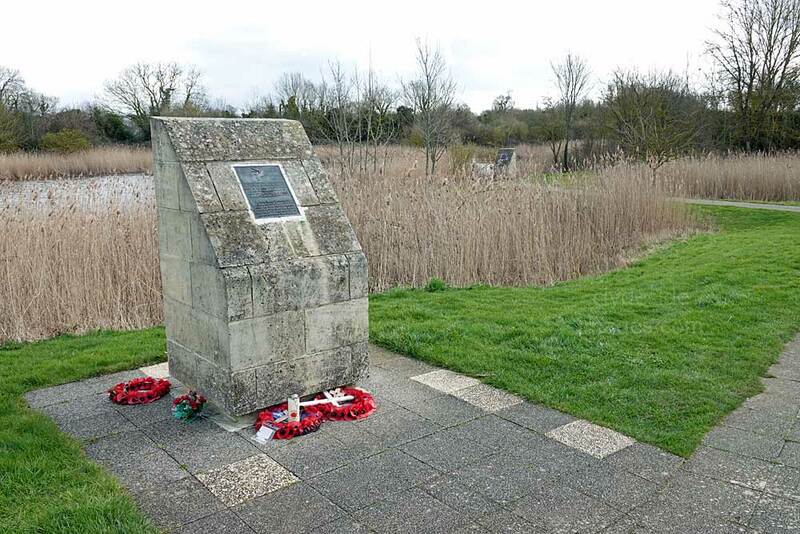 Twenty-nine year-old Lance Corporal Fred Greenhalgh`s body was found in the marsh. Also a member of the Oxford & Bucks Light Infantry, he was likely to have been the first British soldier to die on D-Day and is buried in La Delivrande CWGC Cemetery at Douvres. 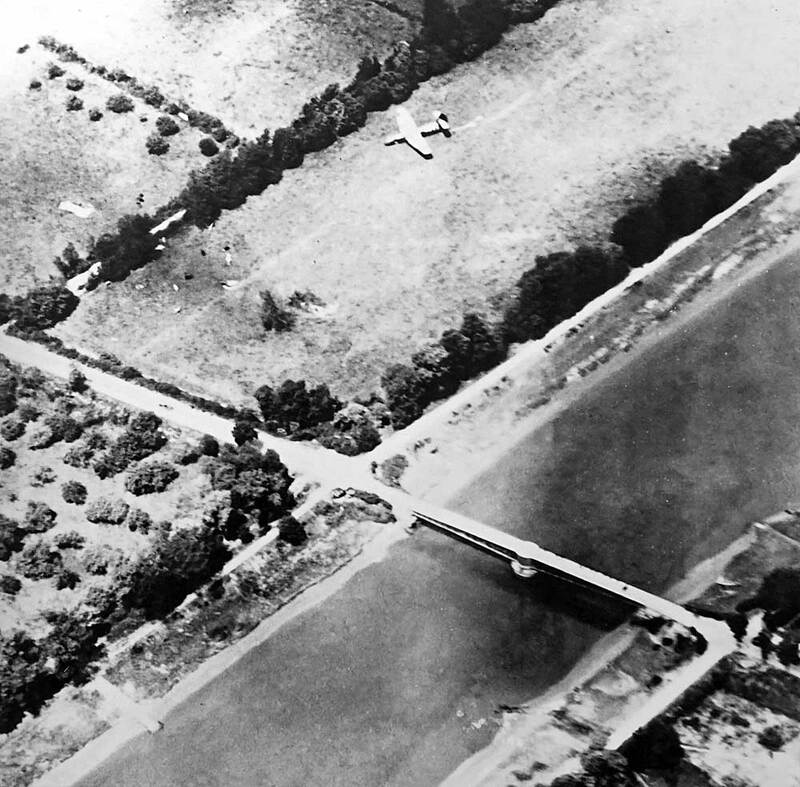 Below right: Although difficult to make out in this aerial photograph of Ranville (Horsa) Bridge, ​an arrestor chute used to slow the glider on landing is just visible at the rear of the aircraft. 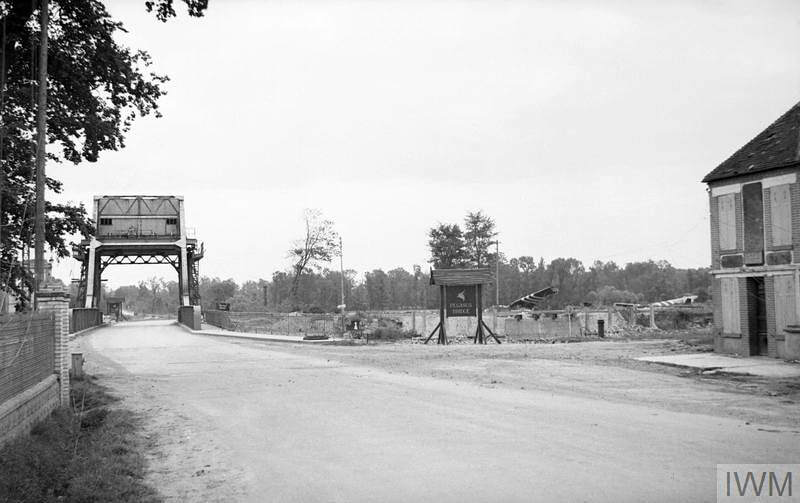 Many of the trees in this area were subsequently felled by Royal Engineers who used the wood as decking for the Bailey Bridges that they erected across the River Orne and Caen Canal. 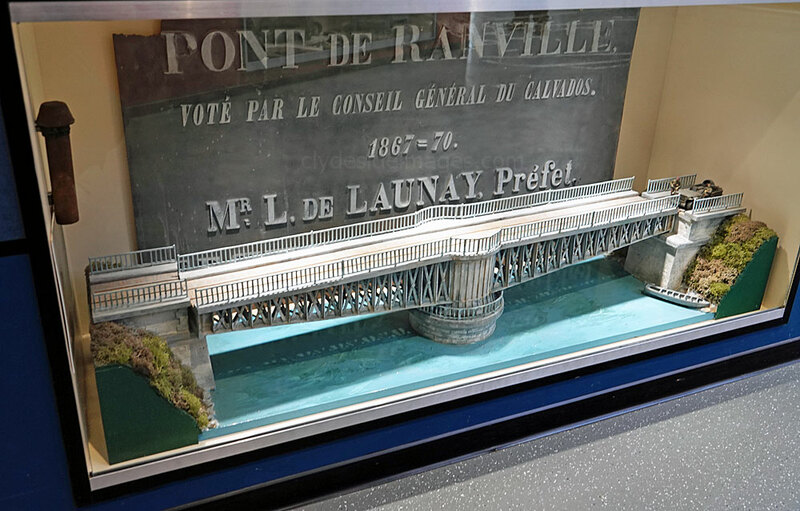 The Ranville Bridge was constructed between 1867 - 1870. 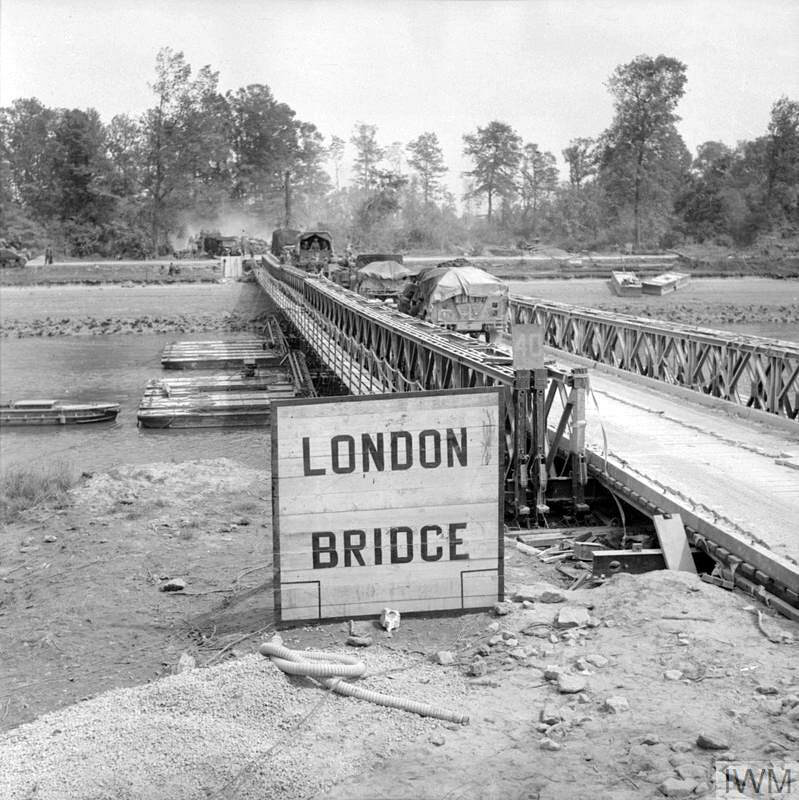 ​In this view taken on 8 June 1944, a lorry from 3rd Division crosses the Ranville Bridge (Horsa Bridge) over the Orne River. 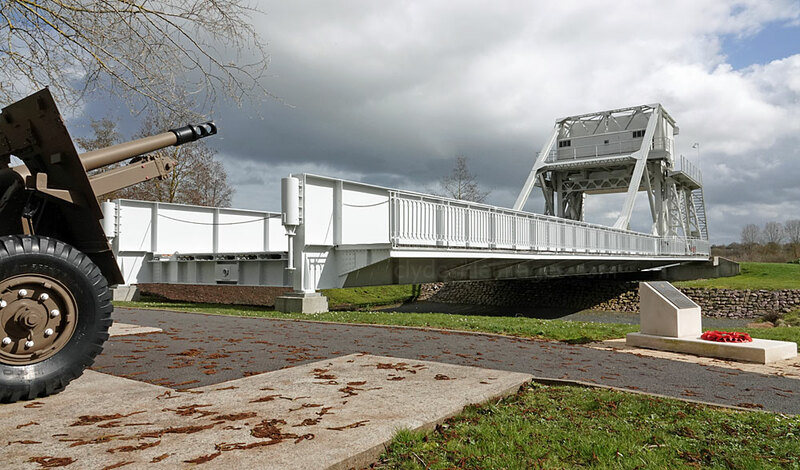 The bridge was captured by 6th Airborne Division in the early hours of D-Day along with Benouville (Pegasus) Bridge. This photo was taken from the east bank. 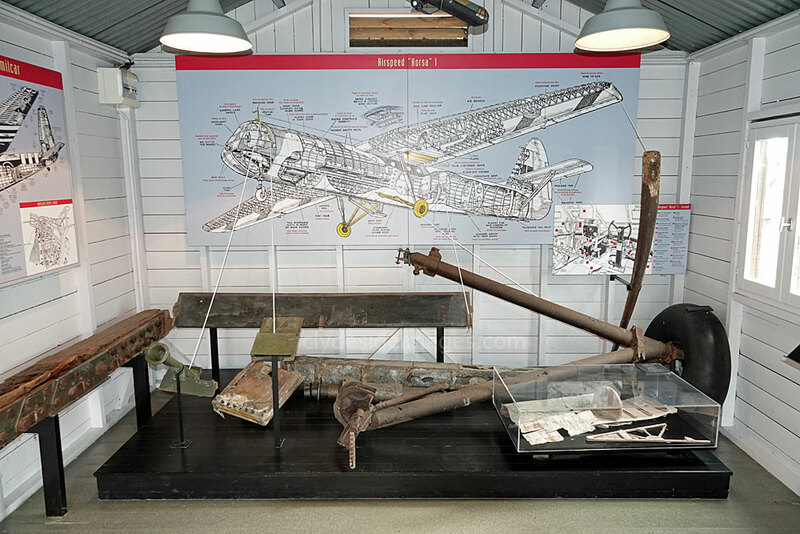 Models of the Horsa and Hamilcar gliders plus the actual skid from Howard`s Horsa. 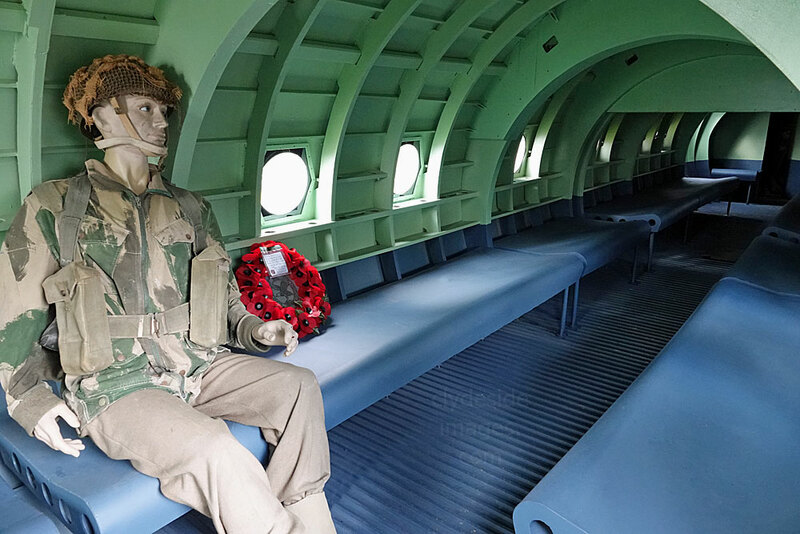 ​For rough ground landings, as in the D-Day assault upon the bridges, glider pilots could jettison the undercarriage and land on the skids. 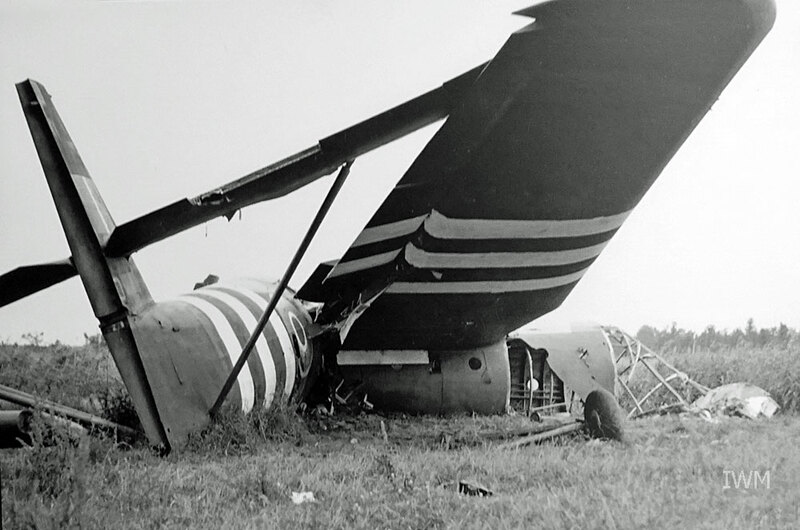 Even so, many aircraft broke in two or disintegrated often injuring many of the occupants. Above: ​Glider pilots in a trailer being pulled by a jeep en route to the assembly area. 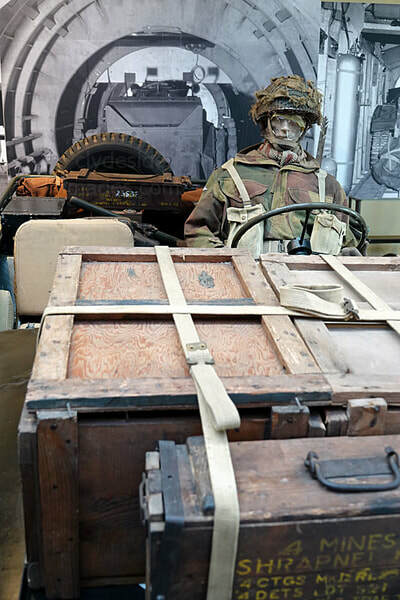 In / on the vehicle itself are L-R Driver Hiram Clough, Lance Corporal Joe Wilkenson and Driver Kenneth Brierley (seated at the back) of 716 Company RASC, 6th Airborne Division, 6 June 1944. 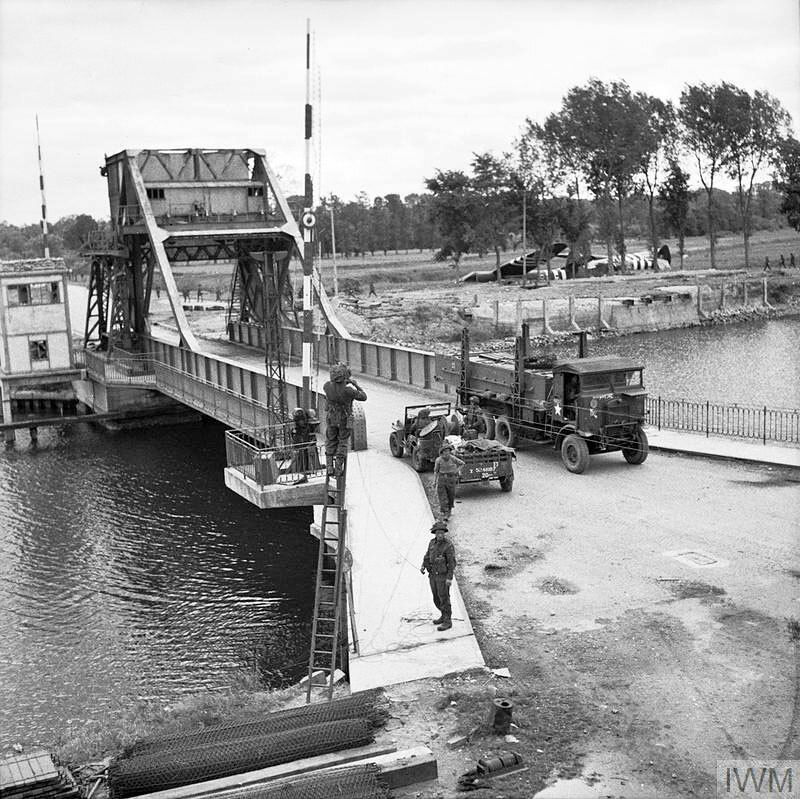 Left: ​Vehicles including a Royal Signals jeep and trailer and RASC Leyland lorry on 'Pegasus Bridge' over the Caen Canal at Benouville, 9 June 1944. The signallers are fixing telephone lines across the bridge. 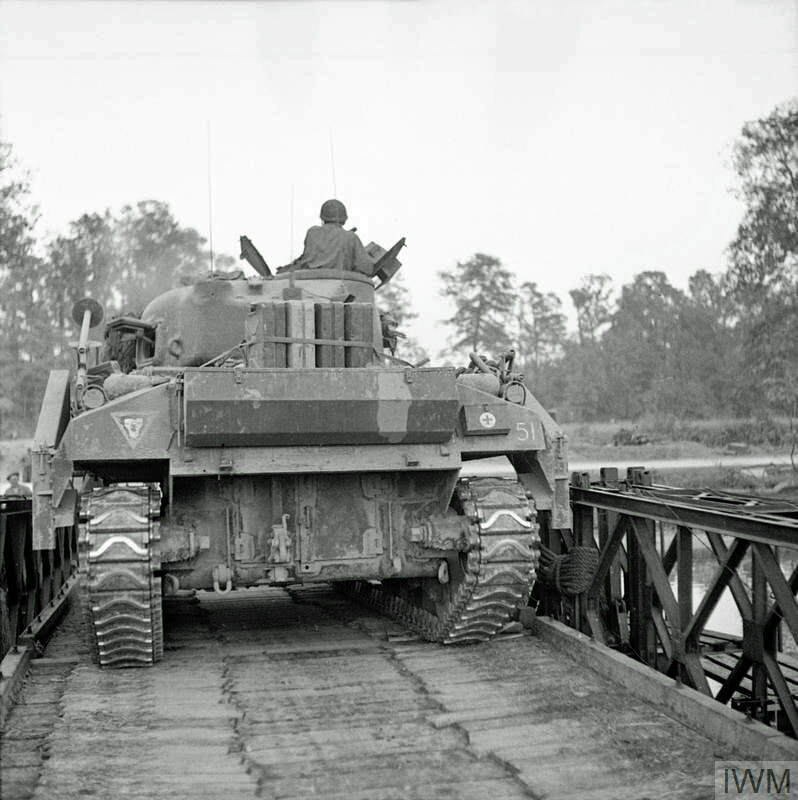 Below: A heavily laden Universal Carrier makes the crossing. 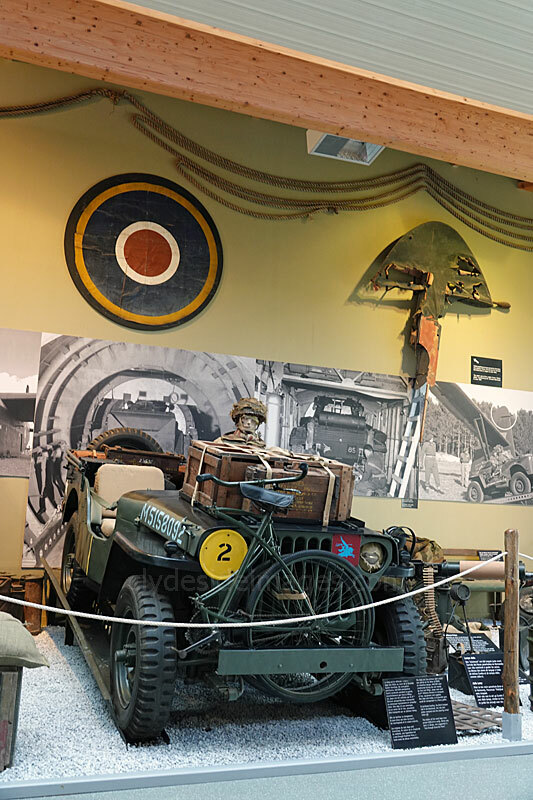 Memorial Pegasus is a superb museum which fittingly honours the skill, determination, courage and sacrifice of the British Airborne troops who captured the strategically vital bridge over the Orne Canal in the early hours of 6 June 1944. 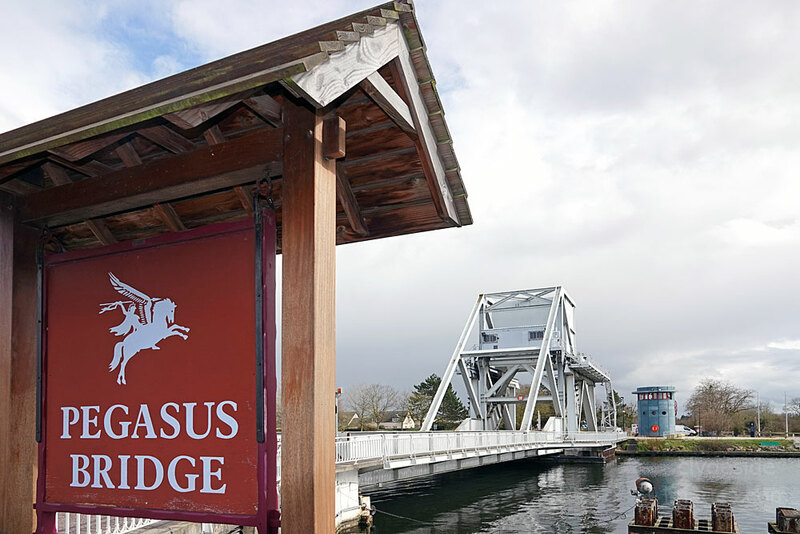 The crossing was subsequently named Pegasus Bridge after the emblem of the Airborne Division. 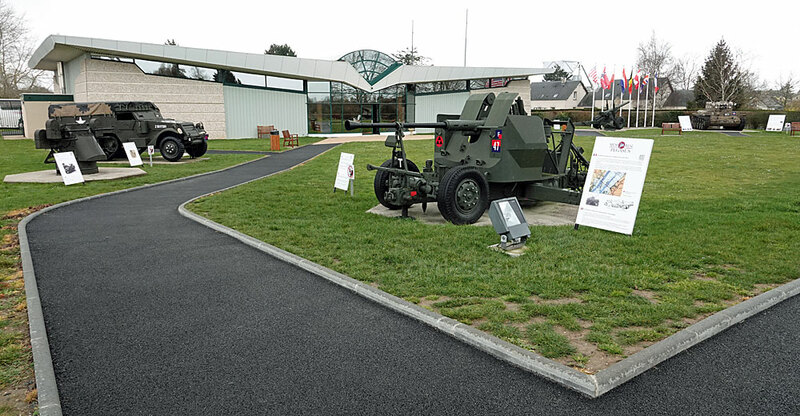 The modern museum building incorporates a glider-shaped roof and houses a remarkable collection of uniforms, weapons, personal effects, models photographs and other items commemorating the men involved in the preparation for, and execution of the initial D-Day assault, as well as some later actions during the war. Many of the exhibits were donated by the troops who fought here and include John Howard’s red beret and Piper Bill Millin’s bagpipes. It was Lord Lovat who led No.6 Commando as they fought their way in from the beaches at Ouistreham to link-up with the Airborne defenders at Pegasus and Millin was at the head of the column, blasting out a tune or two. 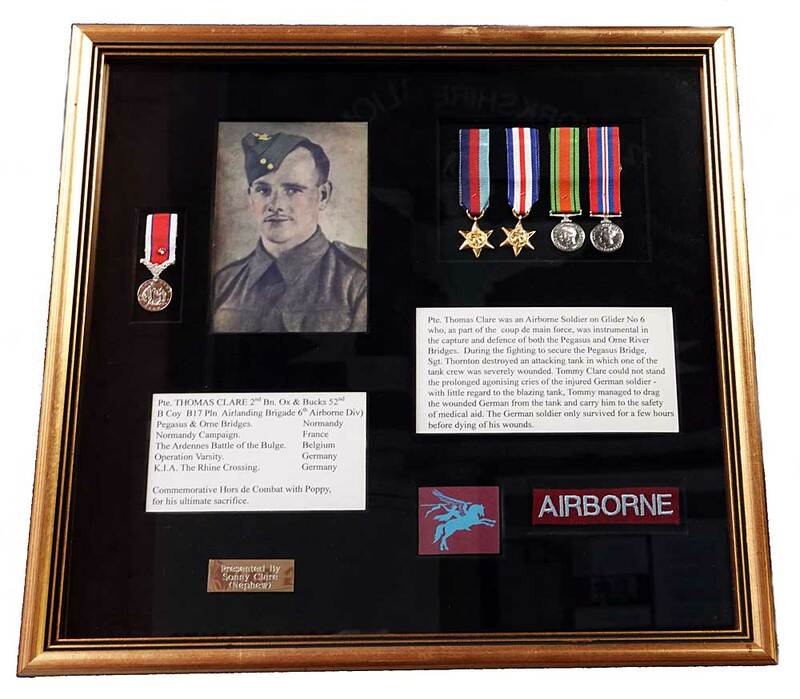 There are also many poignant items including a letter from one soldier, just 17 years of age, to his parents, hoping they were well and telling them not to worry as he was going into action soon. He was one of those killed. Right: These 3ft high stunt puppets, known as `Ruperts`, were dropped along with S.A.S. soldiers at several locations well away from the Normandy beaches and genuine Allied drop zones to fool the enemy into thinking a major attack was underway. 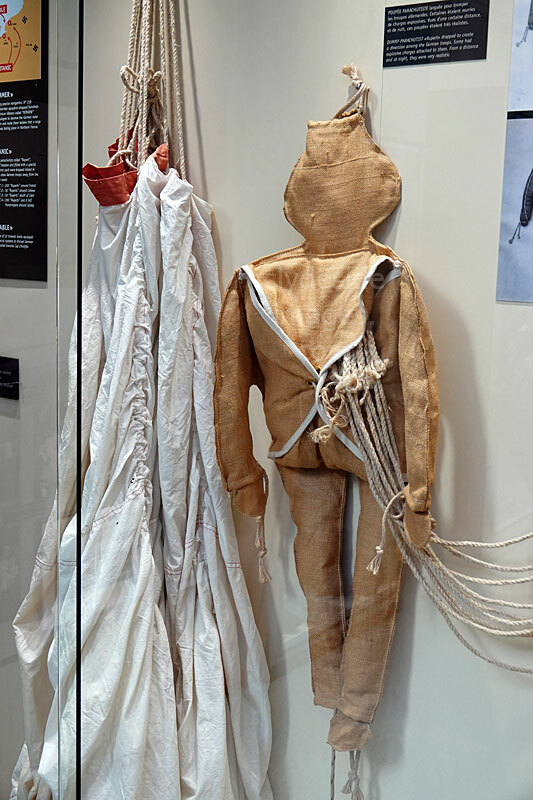 Known as `Operation Titanic`, 500 of these canvas dummies, fitted with a special pyrotechnic pack, were dropped into occupied France during the early hours of 6 June. 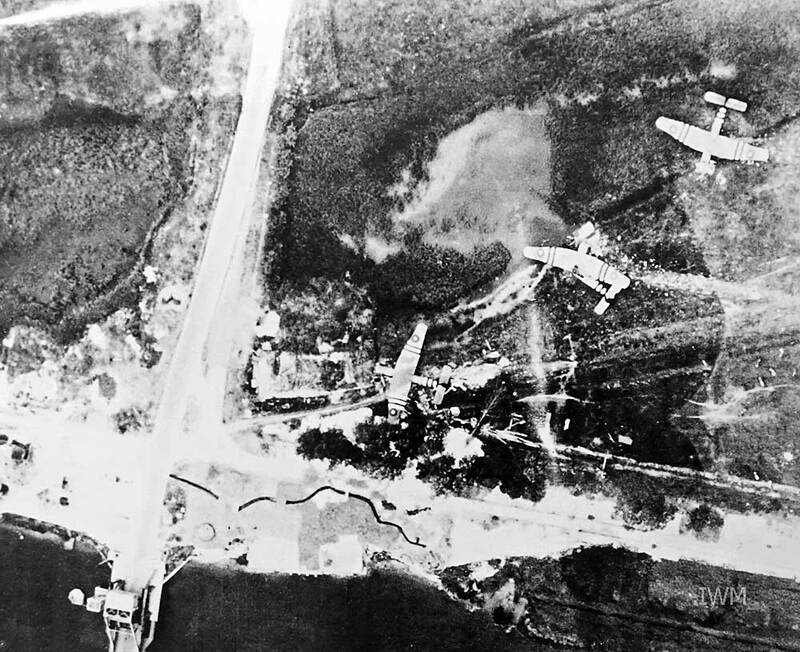 200 landed around Yvetot, 50 around Lisieux, 50 south of Caen and another 200, plus six SAS Paratroopers around Lessay. The Ruperts were designed to let off firecrackers upon landing then burst into flames so the Germans wouldn`t realise what they were. 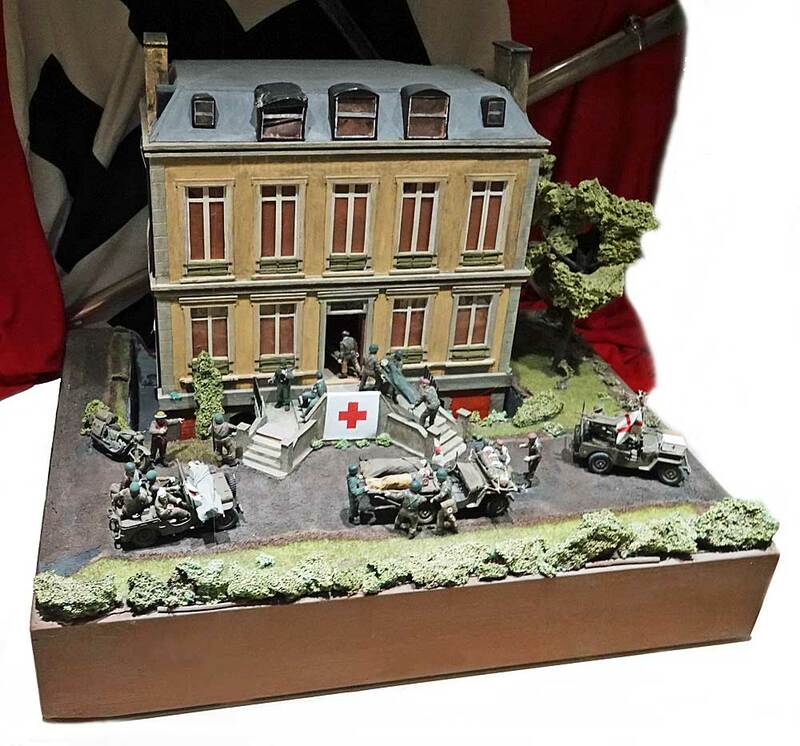 The deception was greatly augmented by the small band of SAS soldiers who parachuted in with the dolls, equipped with loudspeakers through which they played the sounds of a fierce gun battle. Although the Ruperts were only half the size of an average human, they would have appeared lifelike to those looking up from ground level during the hours of darkness. A crew of five was standard but additional troops were needed to manoeuvre this heavy weapon. For years, the primary weapon of Allied tanks was often inferior to those on the German panzers but the development of the Sherman Firefly, complete with 17 pounder, helped to redress the balance. 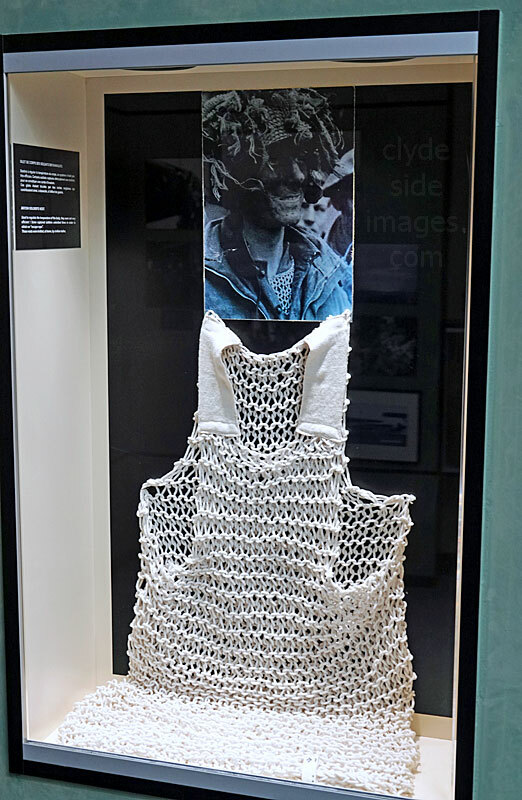 Right: These British soldiers` string vests were hand-knitted by women on the Home Front and although the garments were intended to regulate body temperature, they were not very efficient. Some captured troops un-knotted theirs in order to make an escape rope. 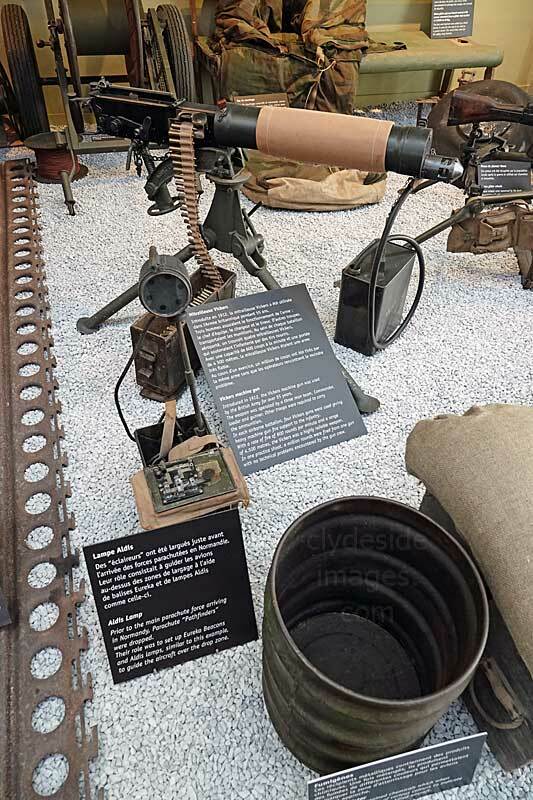 ​Fox troop, 318 Battery 92nd (Loyals), Light Anti-Aircraft Regiment, was tasked with defending the River Orne and Caen Canal Bridges from the Luftwaffe. 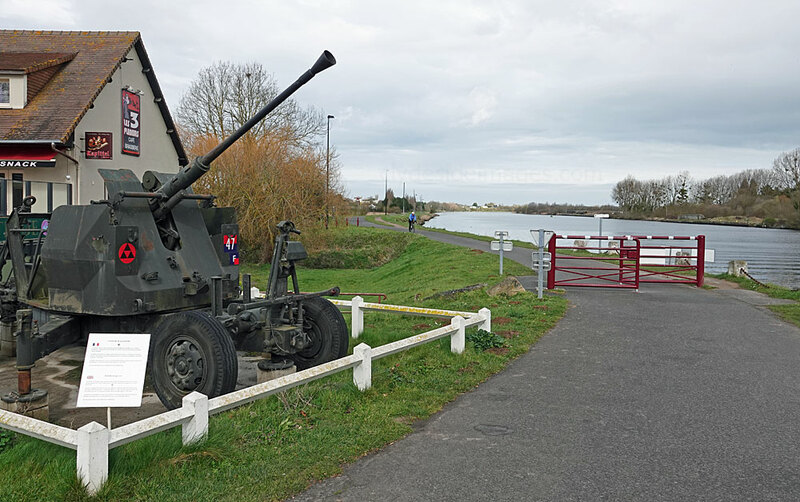 The troop, consisting of six self-propelled 40 mm Bofors Guns like the one shown above, and a signals unit, landed on D-Day and made their way to this location from SWORD Beach. ​During the period 6-15 June, the unit fired an estimated 5,000 rounds downing 17 enemy aircraft. Fire support was also given to Allied ground forces. Captain R.T. Reid, the commanding officer, was awarded the Military Cross for his outstanding leadership in the defence of the bridges. 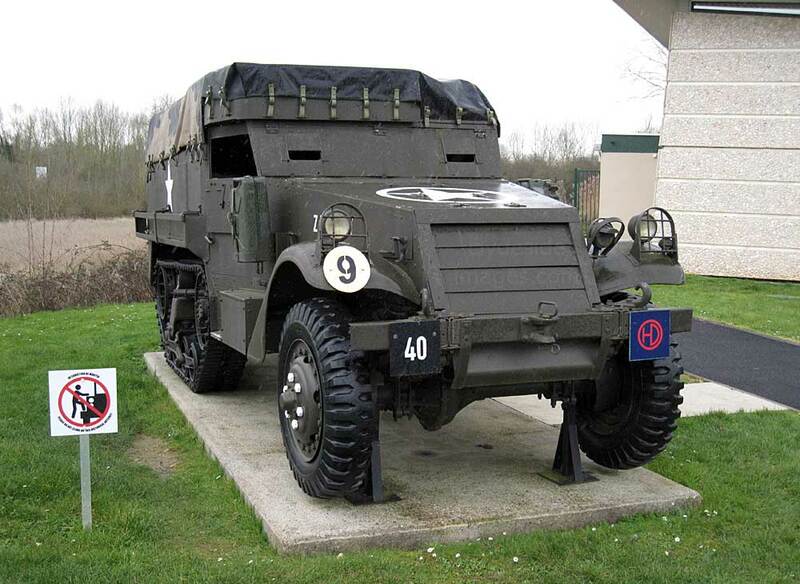 This American-built M3/M5 Half Track bears the insignia of the 51st (Highland) Division on its bumper. 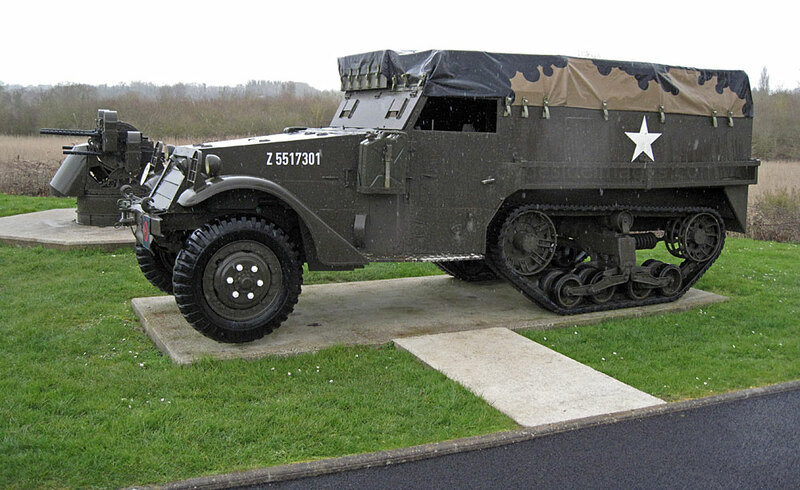 Troops of this Division, nicknamed `The Highland Decorators` by other units due to their habit of erecting numerous HD signs, landed on SWORD Beach on D-Day and fought alongside the 6th Airborne in Normandy. The M3/M5 was used extensively by all Allied Nations during the Second World War with over 41,000 produced in 70 different versions. 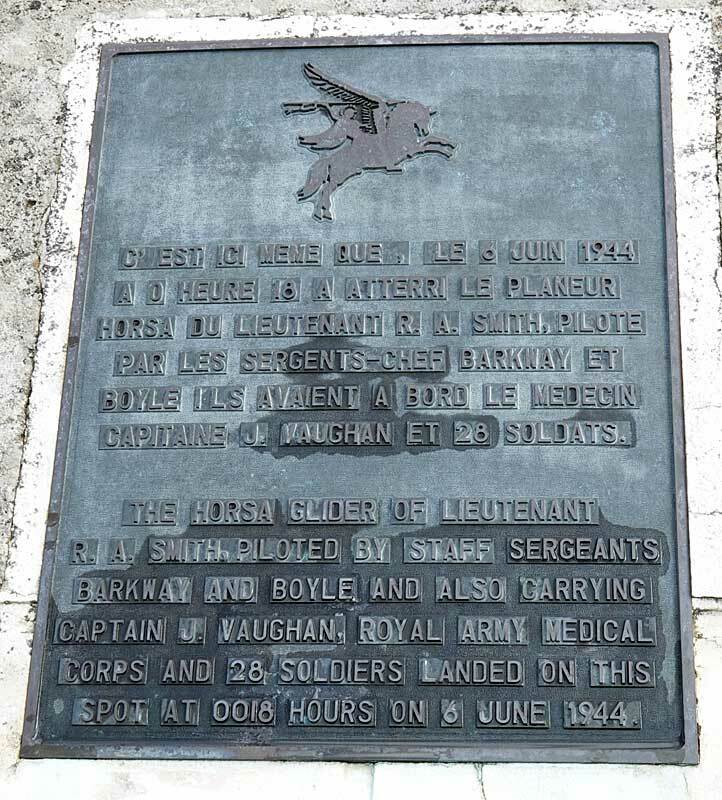 Below: Birds and animals also played an important but often overlooked role in proceedings and there are displays on the dogs and pigeons that contributed to the success of the Paras` missions. 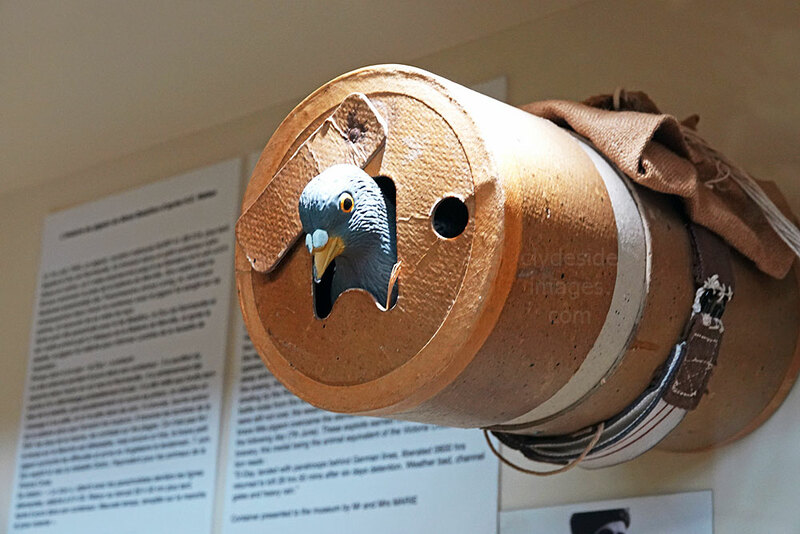 On 1 June 1944, pigeon No.NURP 41SB219, later named `The Duke of Normandy` was placed in a small cardboard container where he remained until being released about 06:00 hrs on 6 June to announce that the guns housed in the Merville Battery had been dealt with. The bird`s mentor was signals officer Lt. Jimmy Loring and prior to his emplaning, the container with his feathered friend was strapped to the front of his equipment under his jump smock. Loring was among the Paras who assaulted and captured the formidable fortifications and `The Duke` was with him all the way. 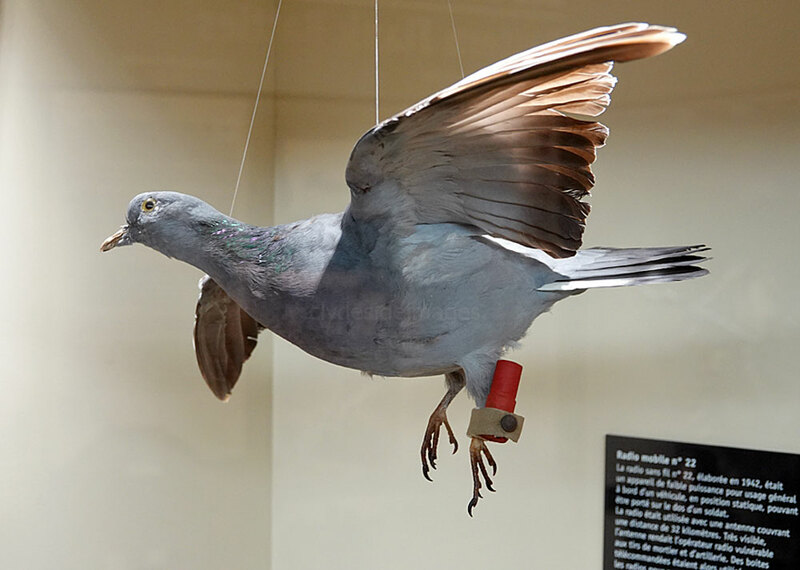 Despite the stormy weather, thousands of aircraft and high-level shelling, the pigeon made it back to his UK base with the success message just over a day later. His exploits earned him the Dicken Medal, better known as the `Animal Victoria Cross`. Left: ​Emile Servais Corteil and his `Para Dog` Glen. ​Para dogs, trained to jump alongside the men, were used by 6th Airborne in Normandy. After landing, the dogs undertook guard and patrol duty, as well as mine detecting. 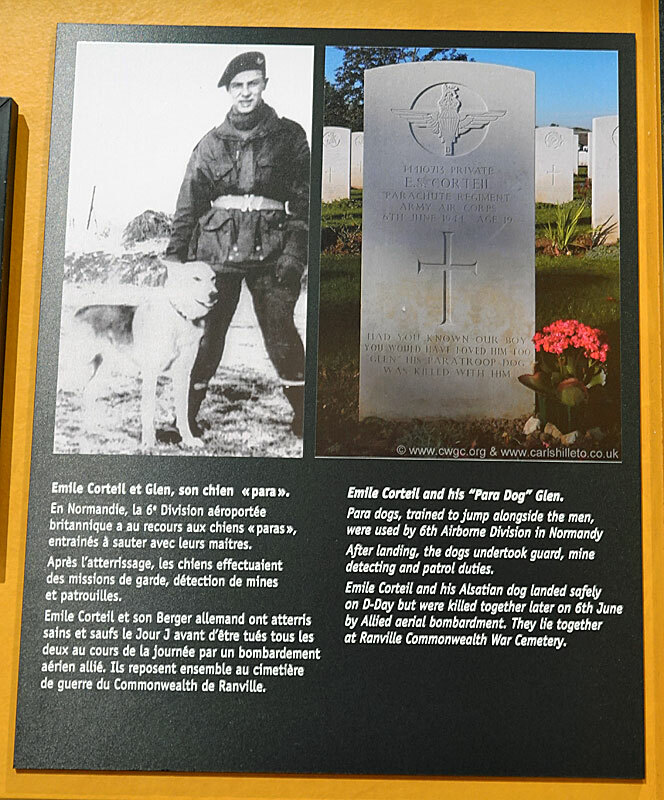 Emile Corteil, serving with A Coy, 9th (Essex) Parachute Battalion, and his dog landed safely on 6 June, but were killed together later on D-Day by an Allied aerial bombardment. Unfortunately, there were many instances of friendly-fire in Normandy, even between Allied units on the ground. 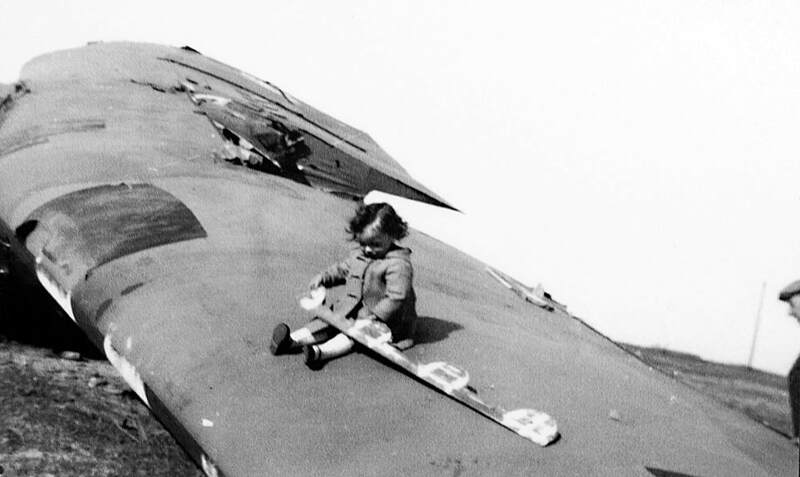 After the battle moved on, at least one of the local children used an abandoned glider as a play thing. Meanwhile adults would salvage parts and equipment. Parachute silk was particularly prized. Above: This is an electrical generator used to charge radio batteries. 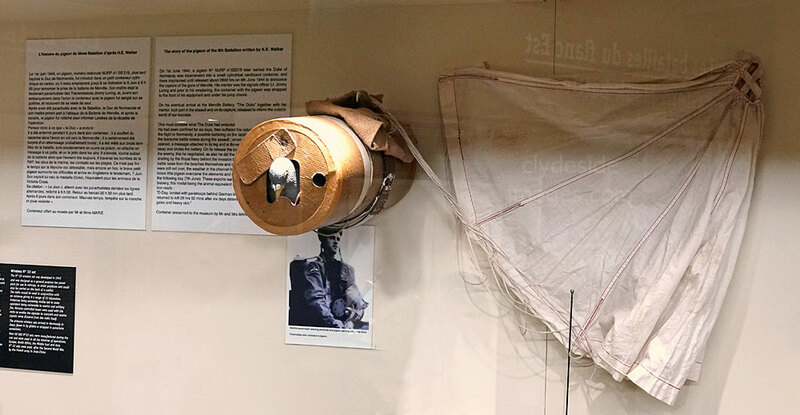 Parachute containers were widely adopted to supply troops with a variety of weapons, food, medical supplies and equipment including stretchers as seen here. 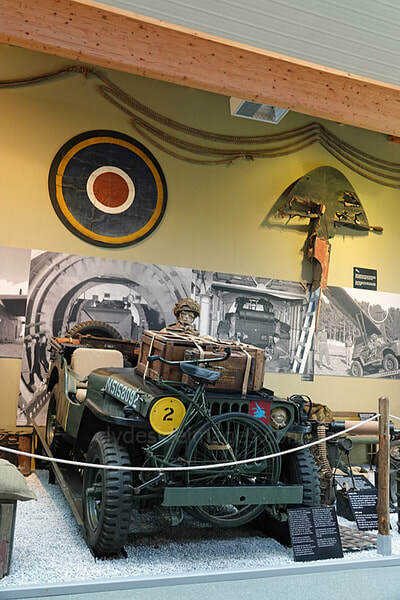 The centrepiece of the external display area here is, unsurprisingly, the actual Pegasus Bridge (albeit it was enlarged slightly after the war) but there’s also a large section of Bailey Bridge, a full-size replica Horsa glider, plus the few armoured vehicles and artillery pieces. 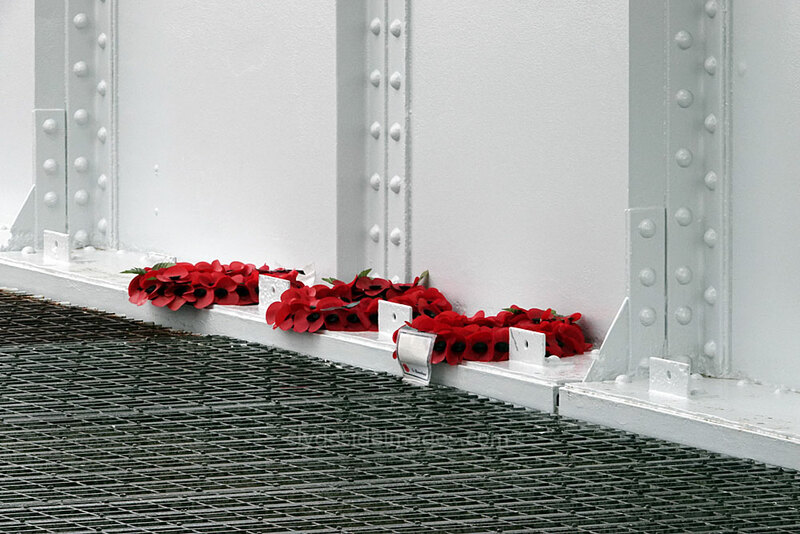 Visitors can step onto and walk across the bridge and imagine how the Airborne troops felt as they stormed the defences on the far side. 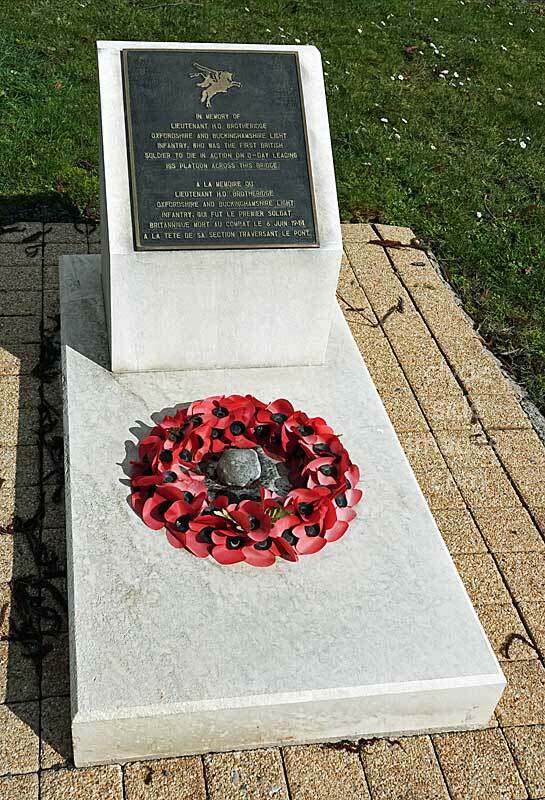 The Coupe de Main Memorial was inaugurated by General Sir Richard Dannatt, then Chief of the General Staff, in 2009 on the 65th anniversary of D-Day. The memorial is dedicated to the men who made the initial assault. 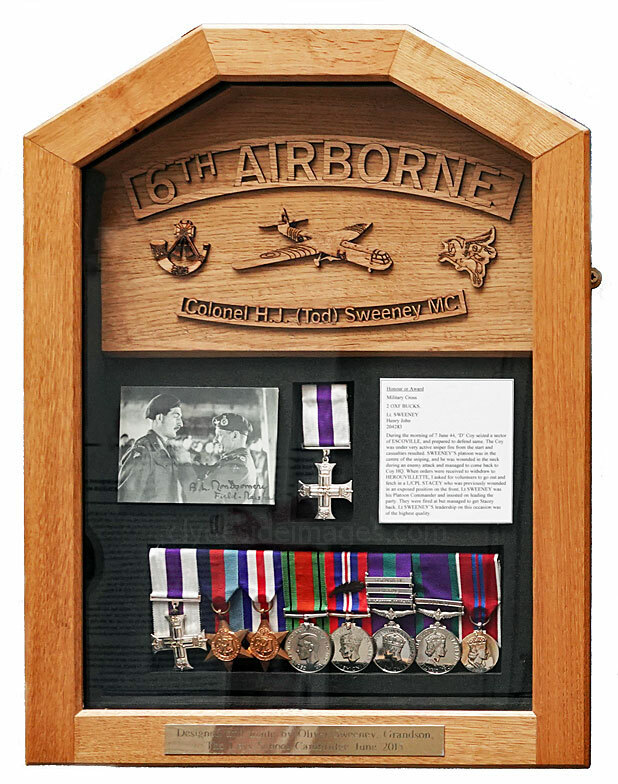 These include the 12 members of the Glider Pilot Regiment, the Ox` & Bucks Airborne troops, and Royal Engineers, Medics from the RAMC and a liaison Officer from 7th Parachute Battalion who were in support. 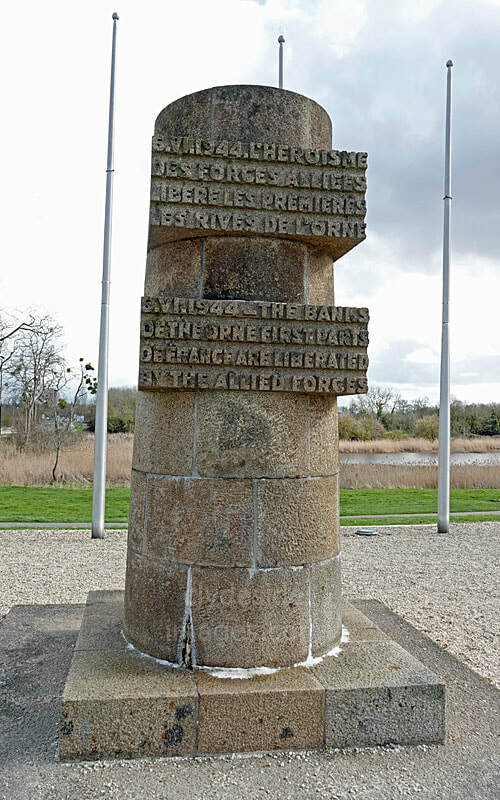 Each of the six stones, placed in a shallow curve beside the original Pegasus Bridge, relates to the involvement of a single glider. 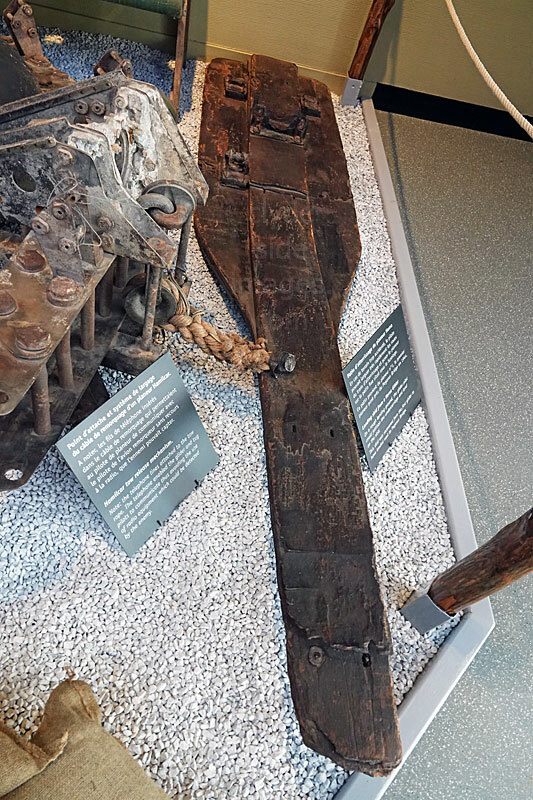 The stones are inscribed with the name of the Halifax tug pilot who towed that particular glider from Tarrant Rushton in Dorset, as well as the names of the Horsa`s 30 other occupants. Four of these men actually participated in the unveiling ceremony. 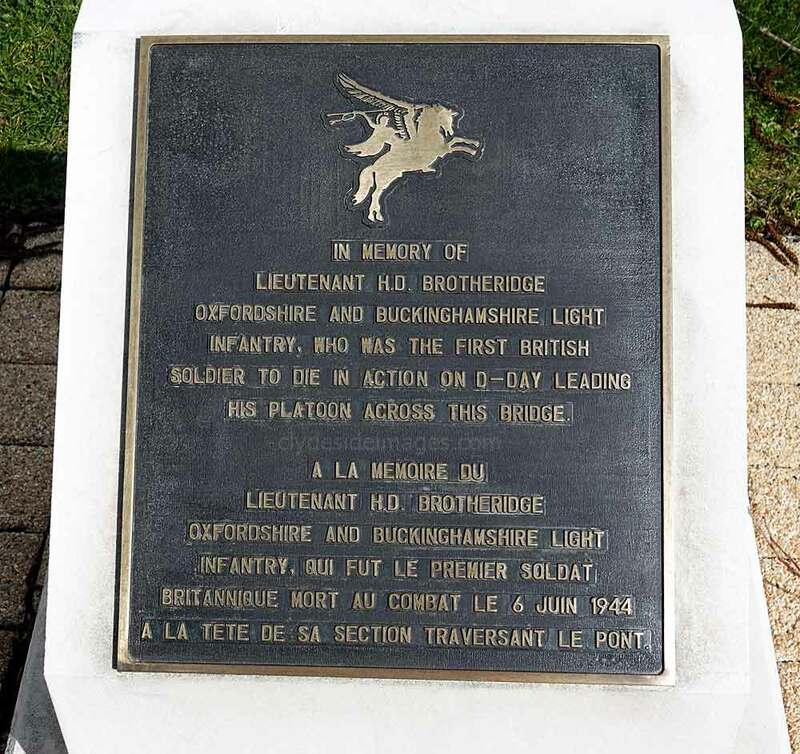 ​Upon landing, the glider pilots and many of the troops were momentarily stunned by the impact of landing but Lt Brotheridge was out right away, leading the first of the attackers over the bridge towards the enemy strongpoints on the far side. He was fatally wounded while throwing a grenade into a German machine gun post making him likely to be the first Allied soldier to die on mainland Europe as a result of enemy fire on D-Day. Brotheridge was 29 years old. Although recommended for a posthumous DSO, his actions were eventually recognised by a Mention in Dispatches. 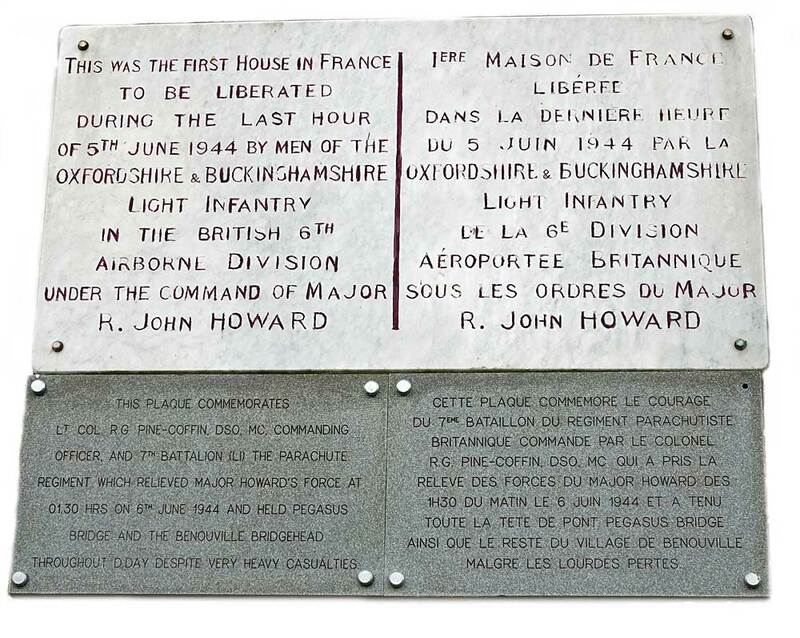 He is now buried in Ranville Churchyard in Normandy. As can be seen, no matter what time of year, wreaths have usually been laid and there is a plaque (not shown) on the bridge to Lance Corporal J. Mullen, a Sapper attached to No.4 Commando Intelligence Section, who lost his life in Normandy and is buried in Hermanville CWGC Cemetery. 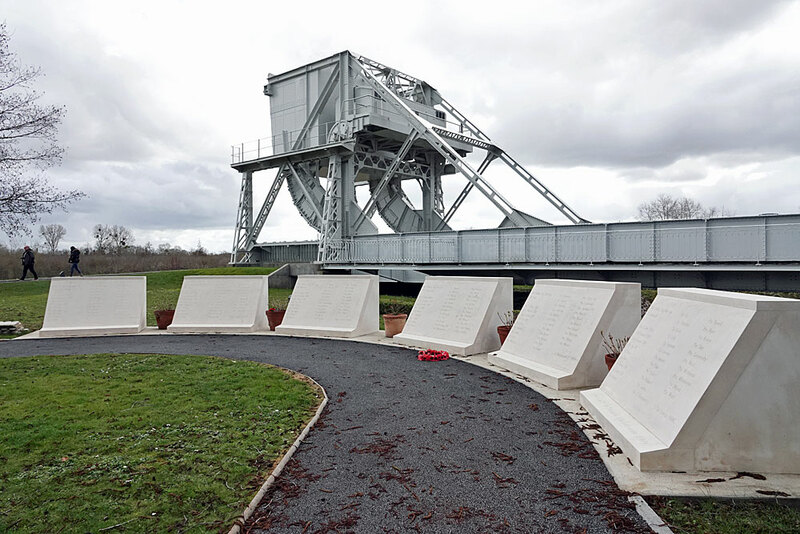 To one side of the bridge is the Coup de Main Memorial which was inaugurated on 6 June 2009 to mark the 65th anniversary of the action and commemorate the men in the gliders which were skilfully flown and landed by a dozen airmen from the Glider Pilot Regiment, enabling Oxford & Bucks infantrymen supported by Royal Engineers, medics from RAMC and a liaison officer from the 7th Parachute Battalion, to carry out the assault. The Airspeed AS.51 Horsa, named after Horsa, the legendary 5th-century conqueror of southern Britain, first flew on 12 September 1941. 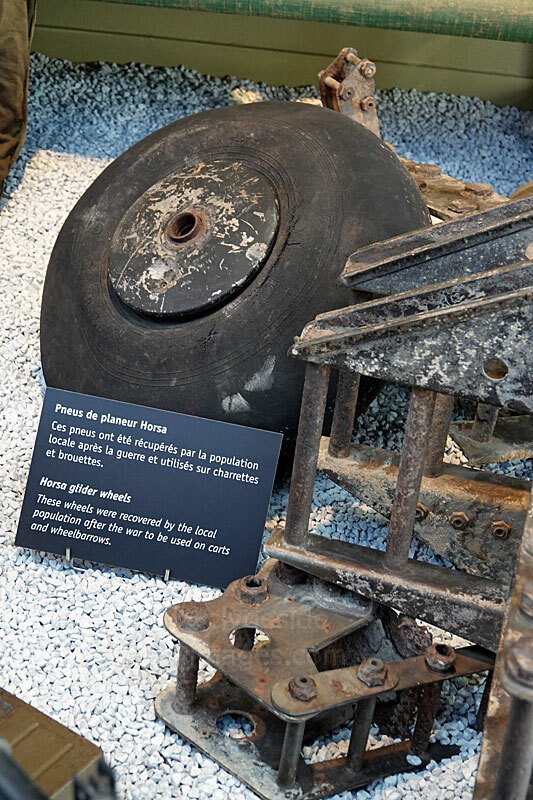 It was developed after Allied ‘top brass’ saw the Germans use gliders to great effect during the Invasion of the Low Countries, particularly during the capture of Fort Eben-Emael in Belgium in May 1940. Around 3,600 Horsas were subsequently produced and used by not only the British, but the Americans, Canadians and later, the Indian Air Force. 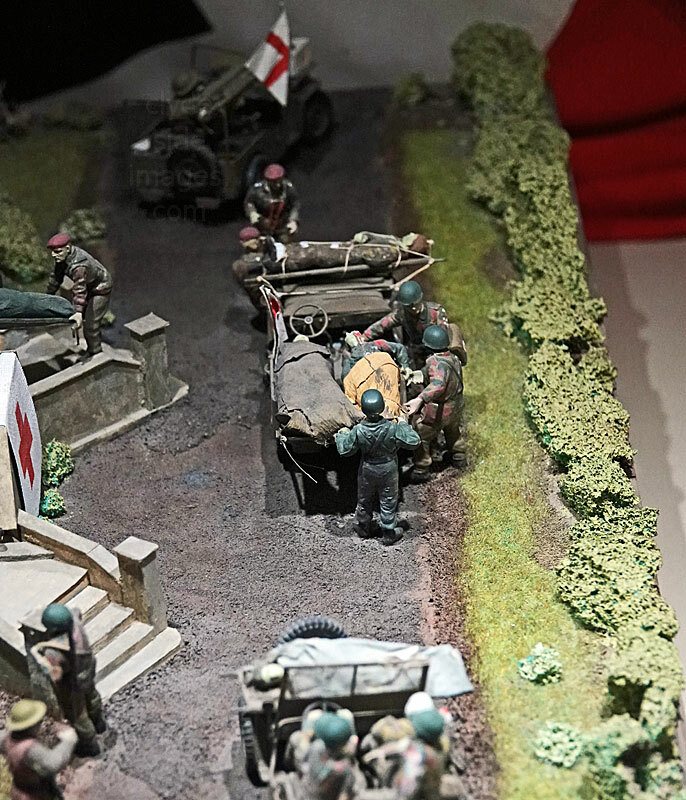 The museum’s full-scale model was unveiled by HRH Prince Charles in 2004, fittingly on 5 June. There’s no access although visitors can duck their heads into the fuselage which contains a full size uniformed figure. 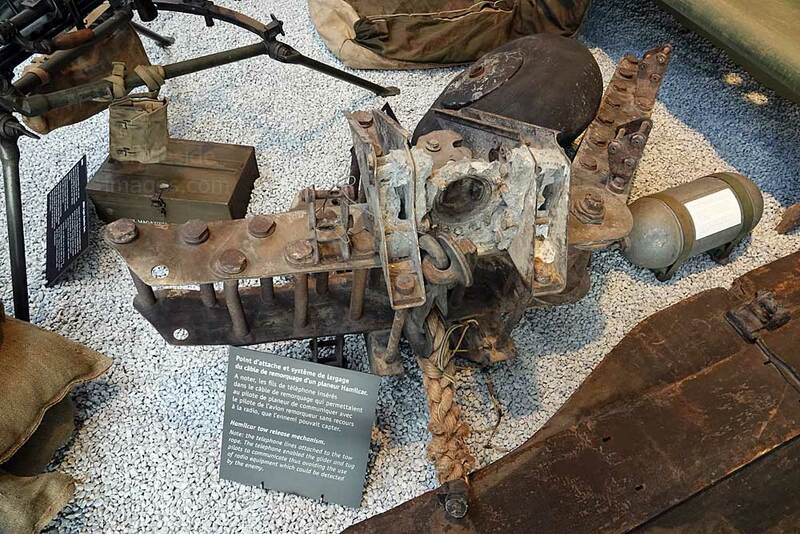 other shot is a Hamilcar tow release mechanism. 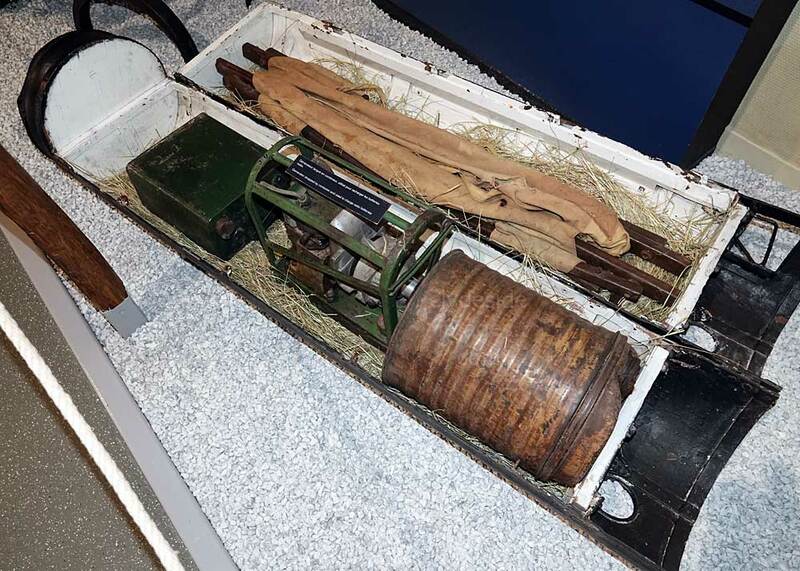 The telephone lines attached to the tow rope enabled the glider and tug pilots to communicate with one another thus avoiding the use of radio equipment which could be detected by the enemy. 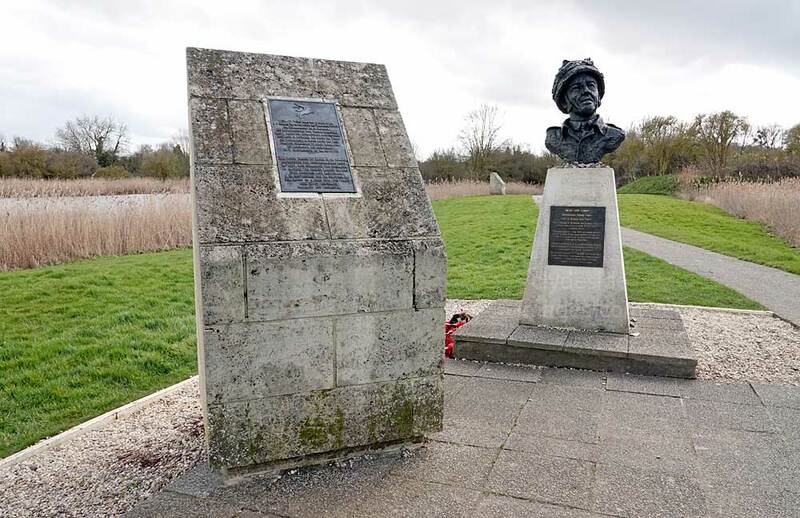 ​On the east bank of the Orne close to the bridge and German anti-tank gun is a bust of John Howard and lectern-style markers showing around the adjacent marsh where individual gliders landed on the fateful night. They include crew details, passengers carried and precise times of landing. Major Howard’s ‘taxi’, PF800, arrived at 00:16 hrs, skidding to a halt just 47 yards from the bridge - a phenomenal piece of flying. 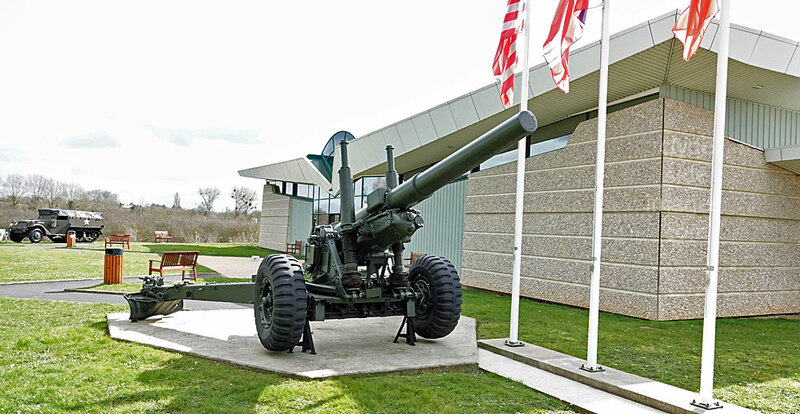 The large stone marker beside the German anti-aircraft gun bears the following text (also in French): `6.VI.1944 - The Banks of The Orne First Parts of France are Liberated by the Allied Forces.`A number of these monuments can be found at various locations connected with the D-Day landings. 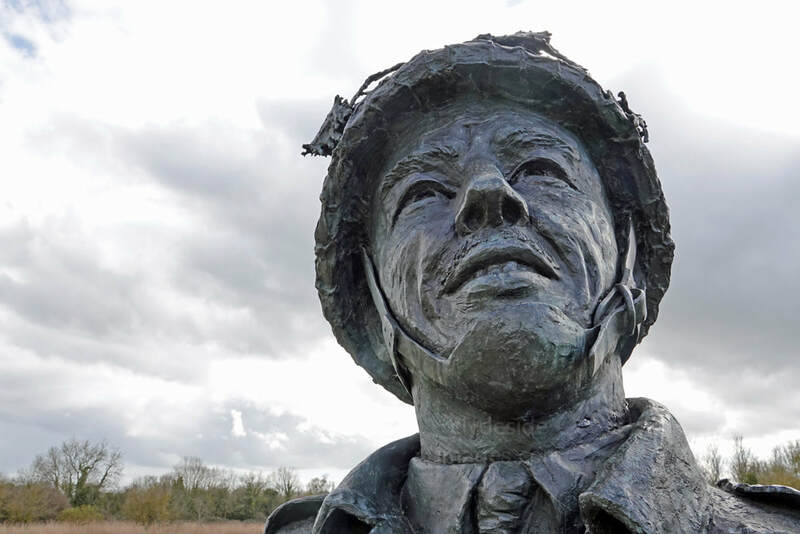 This fine bronze of Brigadier James Hill DSO, MC, by Vivien Mallock stands in the grounds of the Memorial Pegasus museum. A founder of the Parachute Regiment, Hill was one of the most experienced Allied Airborne Commanders. Commissioned into the Royal Fusliers in 1931, he served in France in 1940 and was one of the last British soldiers to be evacuated from Dunkirk. After Parachute training, Hill commanded 1st parachute Battalion in North Africa, Sicily and mainland Italy. 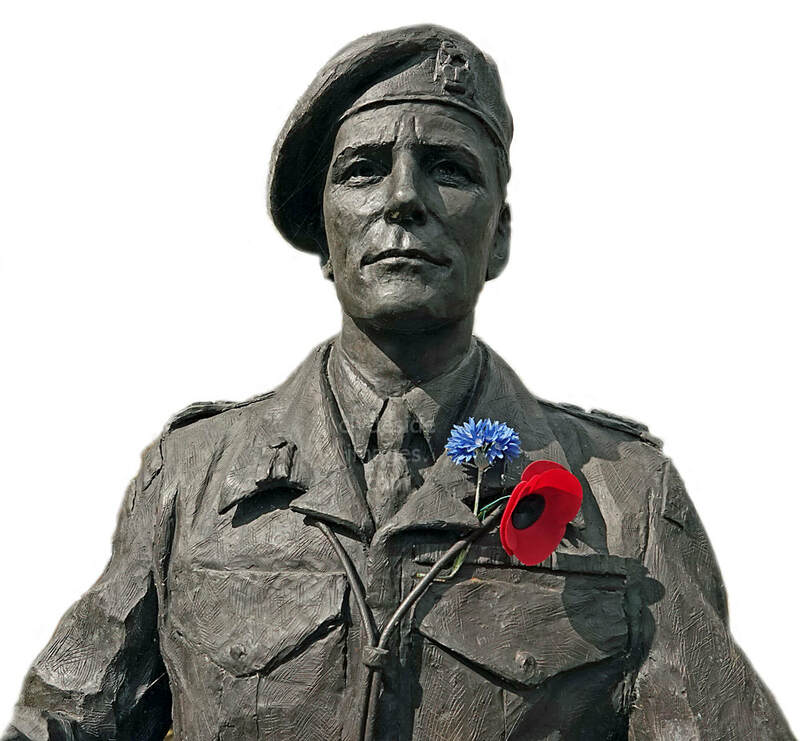 He was promoted to Brigadier at the age of 33 and took command of 3rd parachute Brigade, leading them from Normandy, through France into Belgium, Holland and then Germany. James Hill became the most senior surviving officer of the D-Day Landings. He died in march 2006. 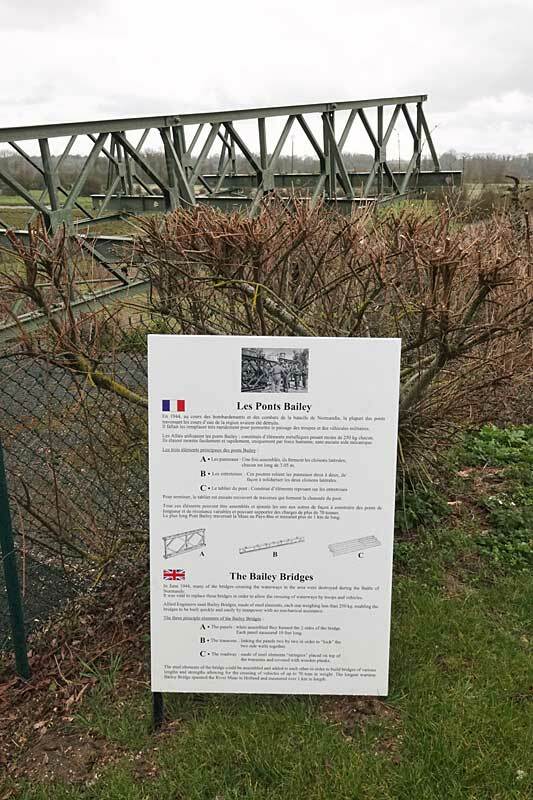 The Bailey Bridge on display is one of around 30 built by the Royal Engineers in the Normandy is weeks after the invasion, with this example coming from the Falaise region. 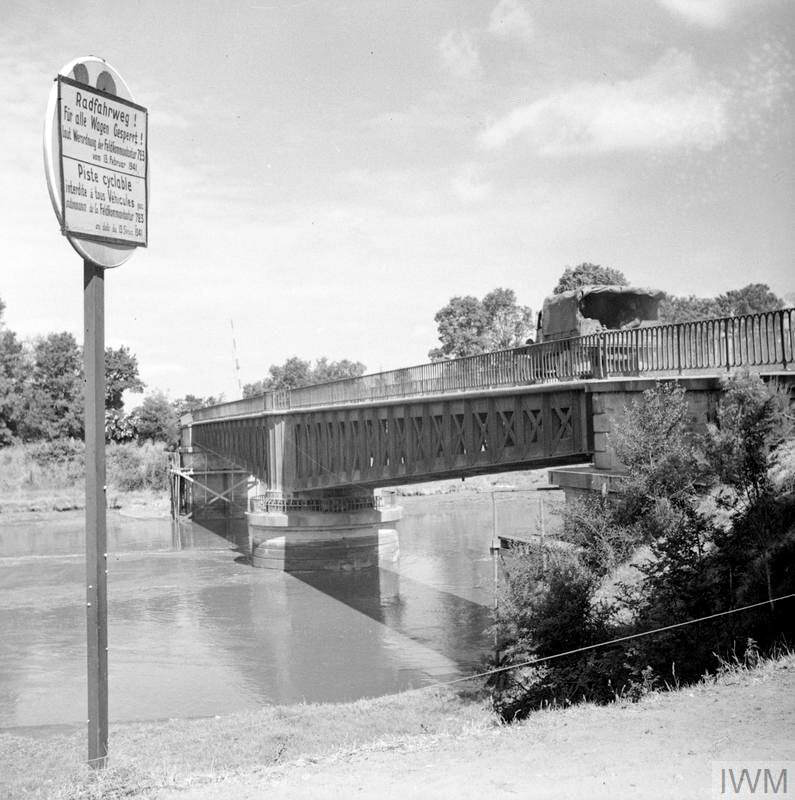 It was vital that not only bridges destroyed in the fighting be replaced at the earliest opportunity, but additional crossings be created to cope with the vast amount of men and materiel heading inland from the beaches towards the front. This is a Centaur A27M tank, known as the Centaur IV. The type is based on the British Army Cromwell. 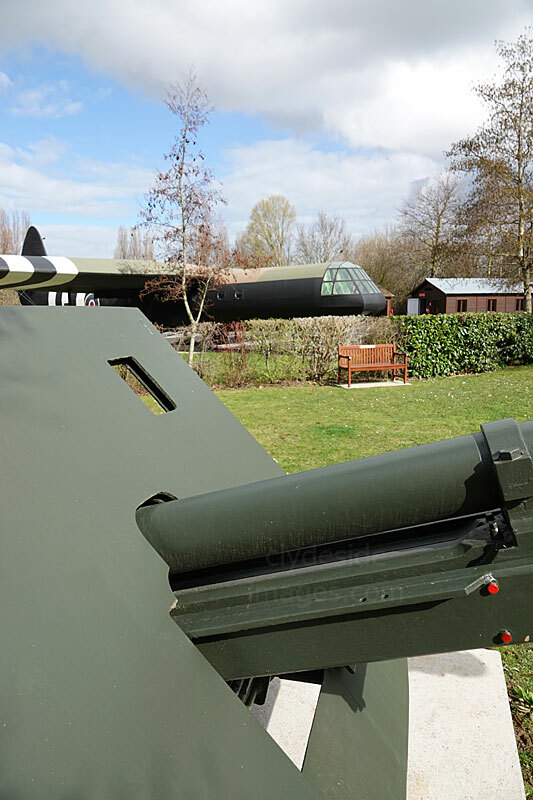 This machine, `Vidette`, landed at la Breche d’Hermanville but was knocked-out and following its recovery in November 1975, it was brought to the Orne and originally placed close to the bridge before being eventually moved into the museum grounds. The large bearing marks on the outside of the turret enabled the crew to fire on coastal targets directly from a landing craft while heading into shore, even in relatively choppy seas. A total of 114 Centaur IVs were produced and many were converted to become one of several types comprising ‘Hobart’s Funnies’. 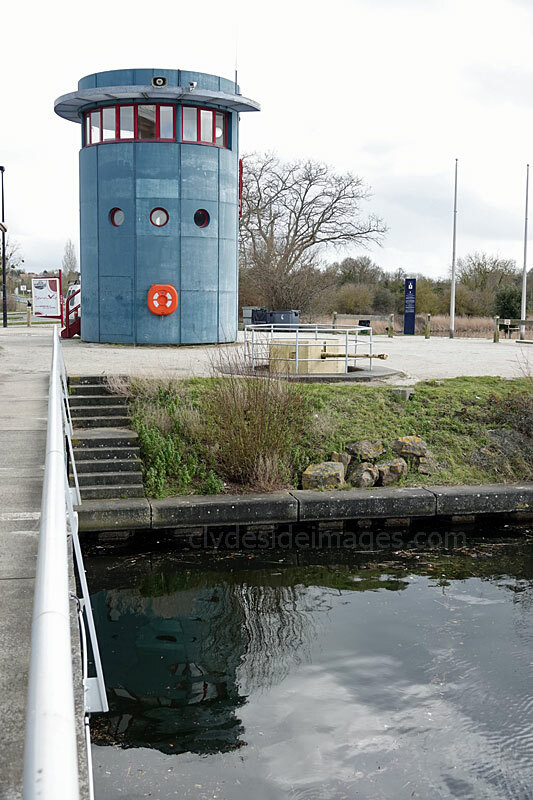 They were fitted with wading gear to enable direct beach landings and the engine inlets and gun apertures were covered to prevent flooding. These tanks were intended to provide close support for infantry and their 95mm (3.74 inch) howitzer could be highly effective against well dug-in defenders. 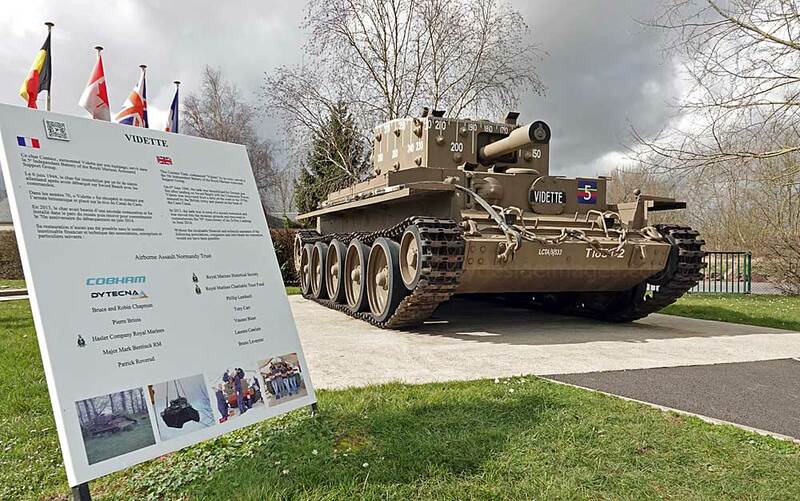 One such tank assisted French Commandos on D-Day at Ouistreham to overcome the town’s Casino which the Germans had heavily fortified. 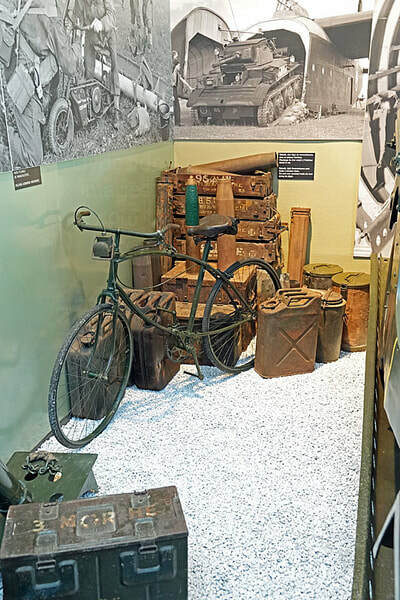 Once the defenders’ heavy guns had been neutralised, the Commandos stormed the building. 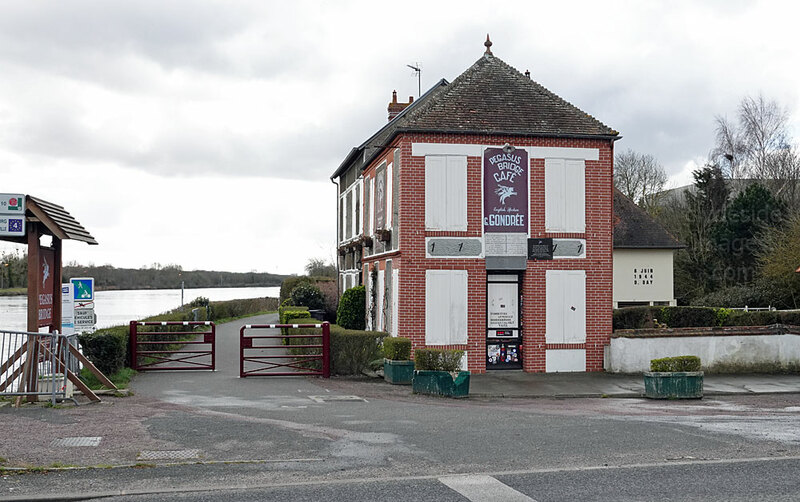 The most famous building at the location, on the west bank of the Orne is Le Café Gondrée, now named the Pegasus Bridge Cafe, but it was well and truly shut when I visited in March, with a sign saying it would reopen on 7 April. 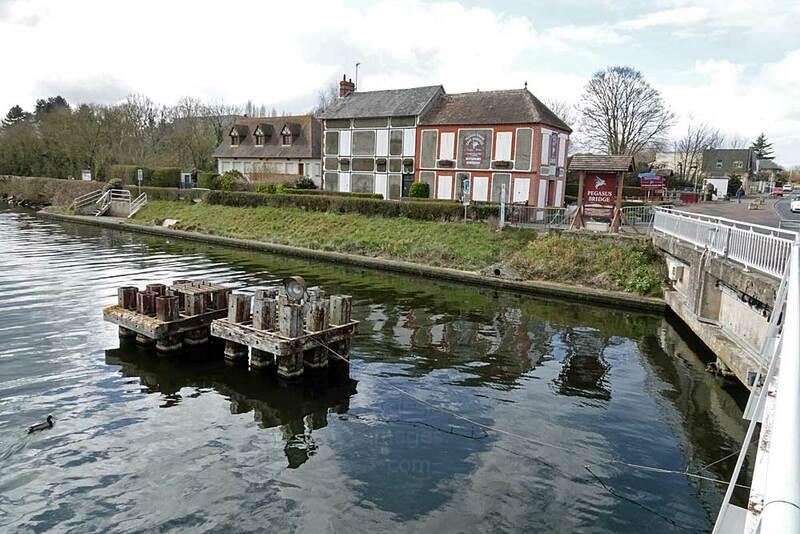 The following view looks back across the Caen Canal from the front of the cafe, which was used as an Aid Post during the battle to secure the bridges. Please bear in mind that all images on this website are Copyright. They are not free to use and have been embedded with a digital watermark. Any black & white photographs from the Imperial War Museum and other organisations` archives have been used courtesy of a `Share & Reuse` policy and are also subject to copyright restrictions. 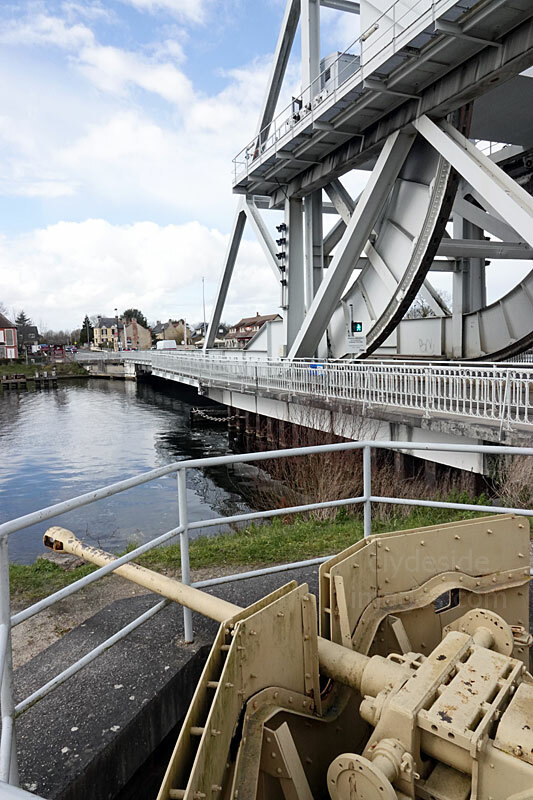 Although the bridge captured by the Allies on D-Day was replaced in April 1994, the new one is essentially the same design as the original although it’s a bit longer and wider. 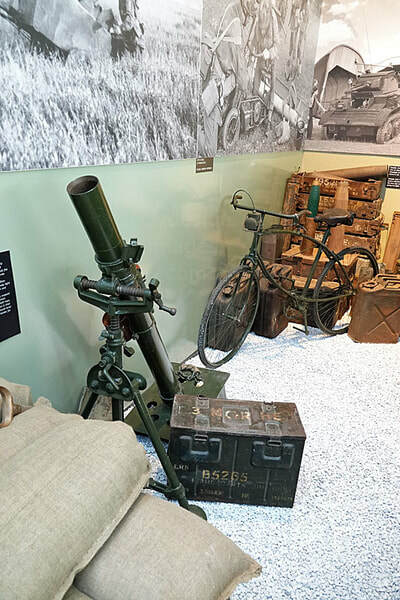 On the east bank, as well as the memorials and items of interest there`s this German 50mm anti-tank gun in a protected gun emplacement known as a Tobruk. 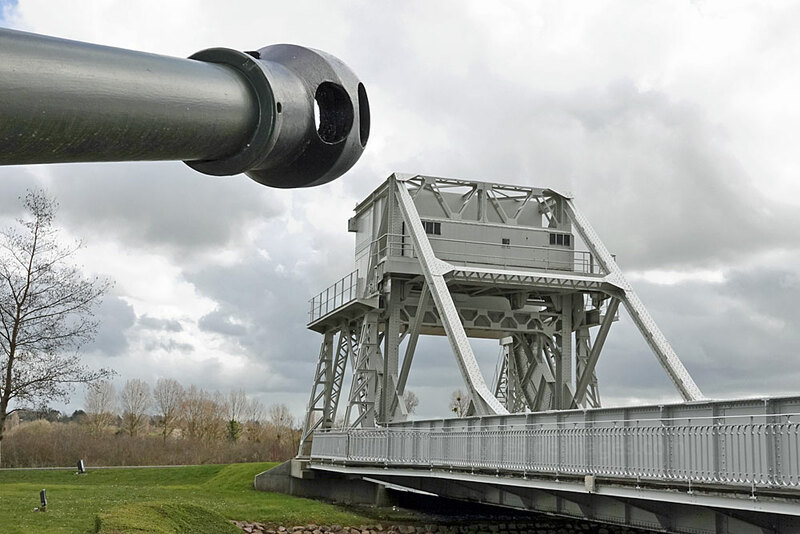 ​Above left: This view of 'Pegasus Bridge' over the Caen Canal at Benouville was taken on 12 July 1944. 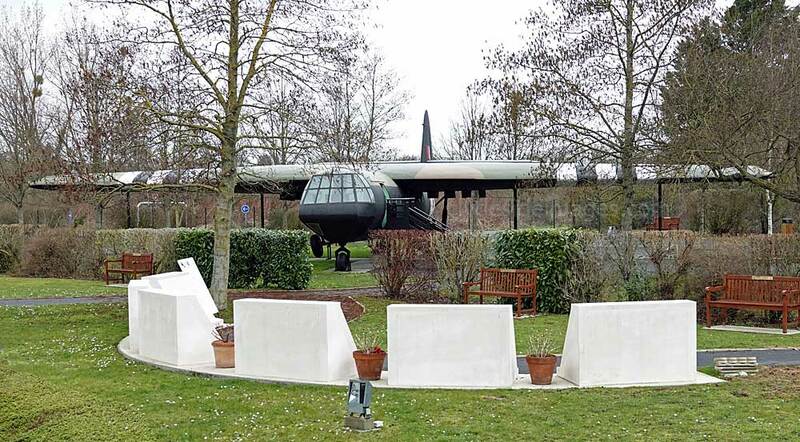 Two of the Horsa gliders that brought the 'coup de main' force in on the night of D-Day are still present and can be seen in the background. Richard Geoffrey Pine-Coffin, who had already seen action in North Africa, dropped into Normandy with his battalion at 00:50 hrs and ensured that all available troops immediately took up defensive positions to reinforce the precarious perimeter held by Howard`s men. The Paras soon came under sustained attack from the 716th Infantry Division, backed by elements of the 21st Panzer Division, but despite mounting losses. 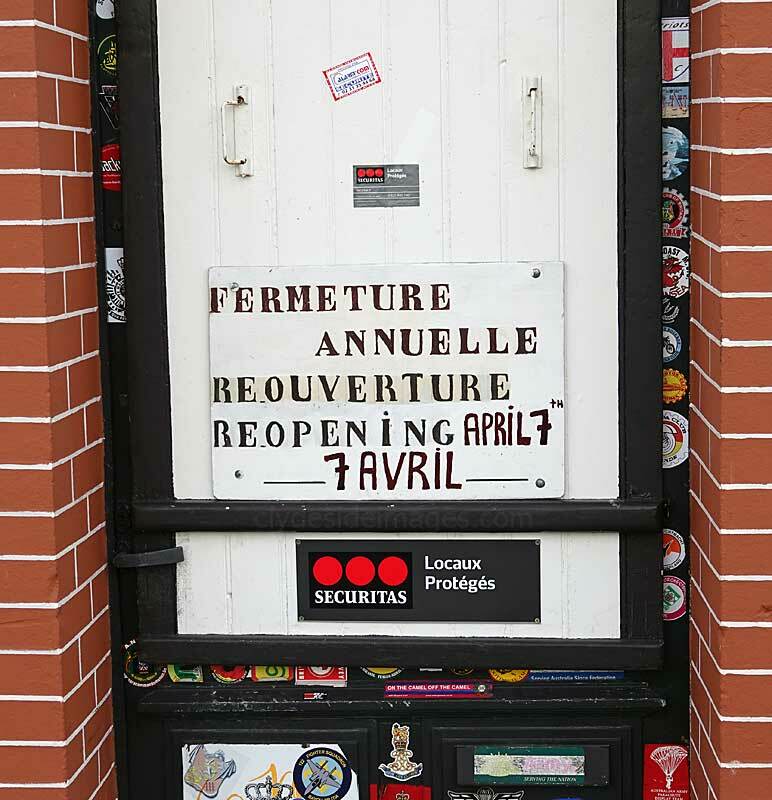 kept the Germans at bay until relief forces arrived from Sword Beach later in the day. Pine-Coffin, referred to as `Wooden Box` by his men, was very tall and insisted on wearing cowboy boots before going into action, to ensure he wouldn`t be mistaken for a German during a fight. 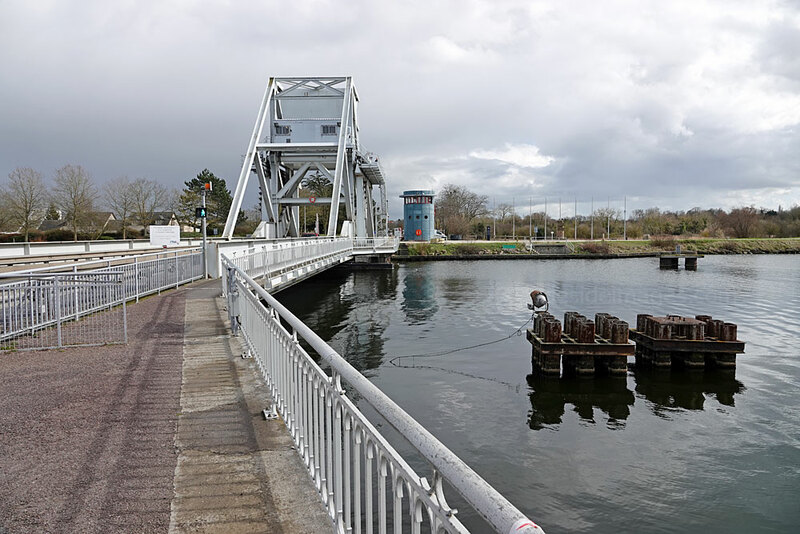 This is the west bank of the Caen Canal at Pegasus Bridge, looking north towards Ouisterham and the coast. ​This revolving model can be found within the Pegasus Memorial. It`s of a house in Ranville taken over by the Allied forces as an aid station after ousting the German garrison. The rear is a cutaway showing casualties being treated in the individual rooms. The Nazi flag placed as a backdrop was seized by Major Reginald M. Tarrant MC of the 13th (Lancashire) Battalion, the Parachute Regiment, as a souvenir. He had dropped into Normandy on DZ `N` at Ranville in the early hours of 6 June. On 19 August, he led an attack on a German-held hill at Putot-en-Auge, east of Caen, and captured the high point, however, as he continued along the ridge to clear the remaining defenders he was shot in the stomach. Although in great pain, he continued to direct the final assault until evacuated. He died of his wounds on the 28th, aged 31 years and is now buried in La Delivrande CWGC Cemetery. Major Tarrant was posthumously awarded the Military Cross for his actions. 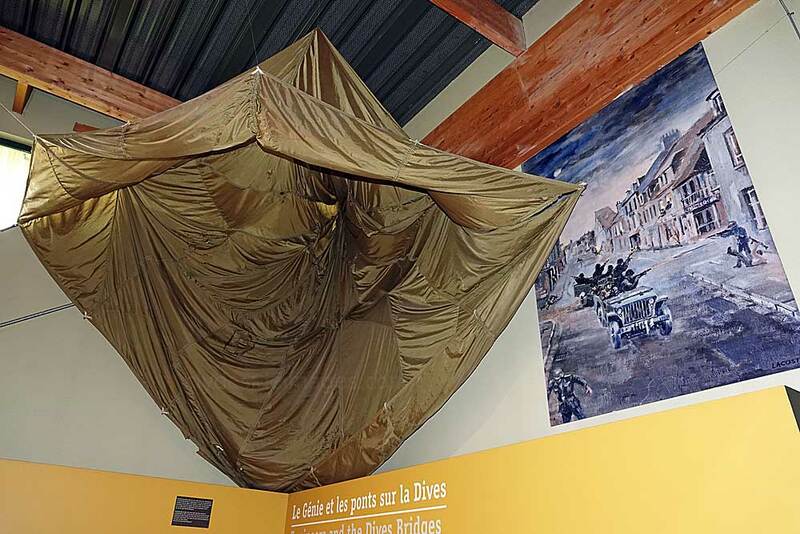 ​The Major`s widow gave the flag to the local mayor who subsequently donated it to the museum. 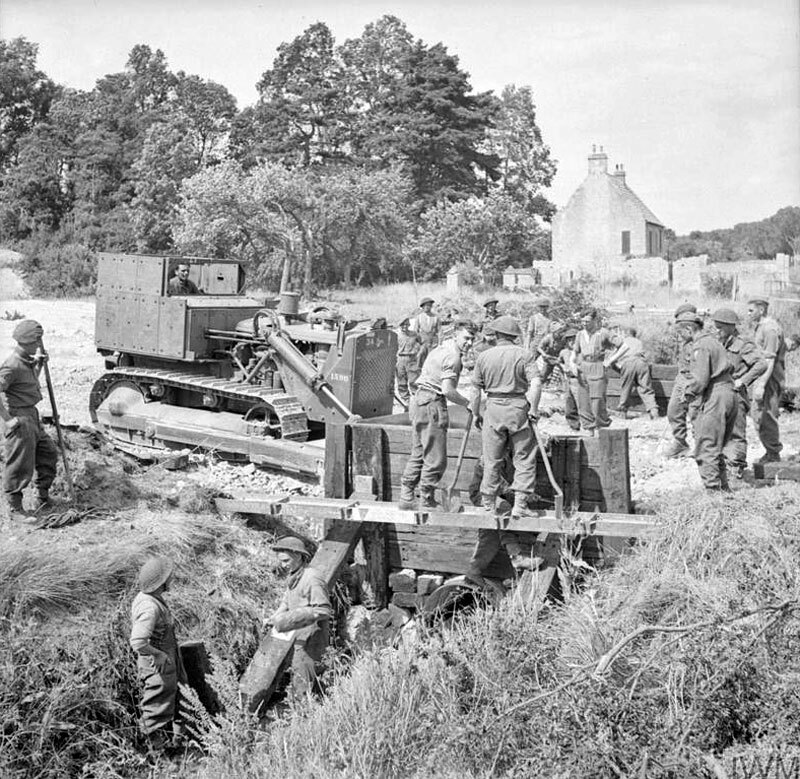 ​Above: Royal Engineers use an armoured bulldozer to level ground on the approaches to a Bailey Bridge over the Caen Canal, 28 June 1944. 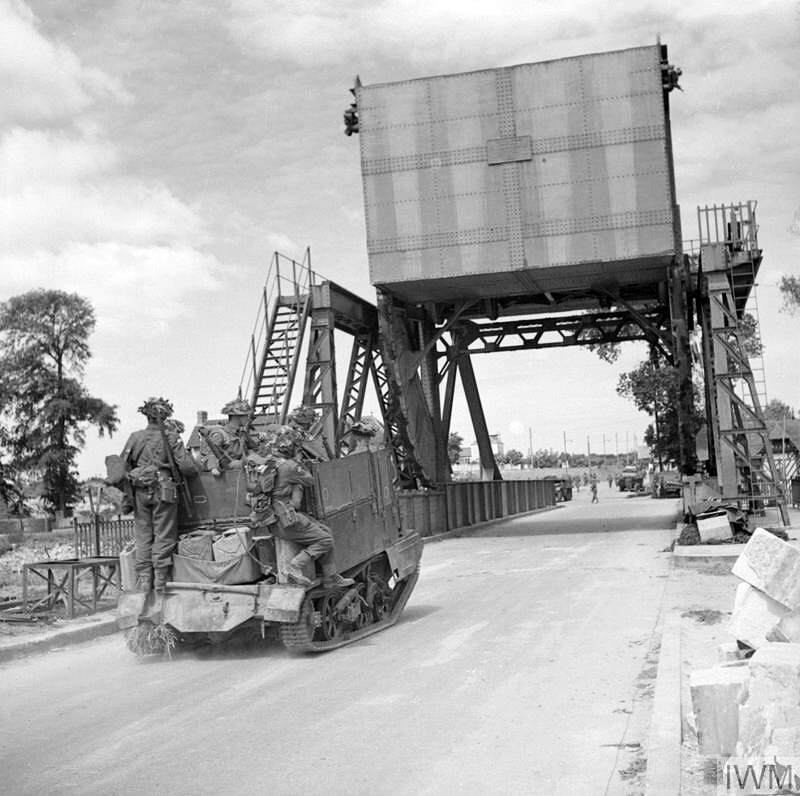 Below: A military convoy and a Sherman Crab flail tank cross into the Orne bridgehead during Operation 'Goodwood', 18 July 1944.